Coordinates: 31°N 35°E﻿ / ﻿31°N 35°E﻿ / 31; 35 Israel (/ˈɪzriəl, ˈɪzreɪəl/; Hebrew: יִשְׂרָאֵל; Arabic: إِسْرَائِيل‎), officially the State of Israel, is a country in Western Asia, located on the southeastern shore of the Mediterranean Sea and the northern shore of the Red Sea. It has land borders with Lebanon to the north, Syria to the northeast, Jordan on the east, the Palestinian territories of the West Bank and Gaza Strip to the east and west, respectively, and Egypt to the southwest. The country contains geographically diverse features within its relatively small area. Israel's economic and technological center is Tel Aviv, while its seat of government and proclaimed capital is Jerusalem, although the state's sovereignty over Jerusalem has only partial recognition. This article is about the modern country. For other uses, see Israel (disambiguation). ^ 20,770 km2 is Israel within the Green Line. 22,072 km2 includes the annexed Golan Heights and East Jerusalem. 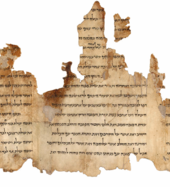 This article contains Hebrew and Arabic text. Without proper rendering support, you may see question marks, boxes, or other symbols. Israel has evidence of the earliest migration of hominids out of Africa. Canaanite tribes are archaeologically attested since the Middle Bronze Age, while the Kingdoms of Israel and Judah emerged during the Iron Age. The Neo-Assyrian Empire destroyed Israel around 720 BCE. Judah was later conquered by the Babylonian, Persian and Hellenistic empires and had existed as Jewish autonomous provinces. The successful Maccabean Revolt led to an independent Hasmonean kingdom by 110 BCE, which in 63 BCE however became a client state of the Roman Republic that subsequently installed the Herodian dynasty in 37 BCE, and in 6 CE created the Roman province of Judea. 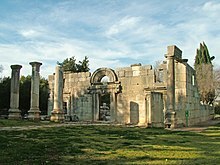 Judea lasted as a Roman province until the failed Jewish revolts resulted in widespread destruction, expulsion of Jewish population and the renaming of the region from Iudaea to Syria Palaestina. Jewish presence in the region has persisted to a certain extent over the centuries. In the 7th century CE, the Levant was taken from the Byzantine Empire by the Arabs and remained in Muslim control until the First Crusade of 1099, followed by the Ayyubid conquest of 1187. The Mamluk Sultanate of Egypt extended its control over the Levant in the 13th century until its defeat by the Ottoman Empire in 1517. During the 19th century, national awakening among Jews led to the establishment of the Zionist movement in the diaspora followed by waves of immigration to Ottoman Syria and later British Mandate Palestine. In 1947, the United Nations (UN) adopted a Partition Plan for Palestine recommending the creation of independent Arab and Jewish states and an internationalized Jerusalem. The plan was accepted by the Jewish Agency, and rejected by Arab leaders. The following year, the Jewish Agency declared the independence of the State of Israel, and the subsequent 1948 Arab–Israeli War saw Israel's establishment over most of the former Mandate territory, while the West Bank and Gaza were held by neighboring Arab states. 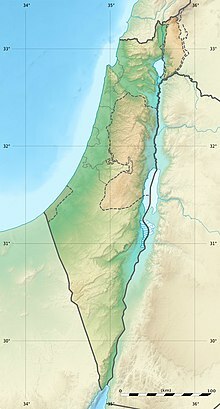 Israel has since fought several wars with Arab countries, and since the Six-Day War in 1967 held occupied territories including the West Bank, Golan Heights and the Gaza Strip (still considered occupied after the 2005 disengagement, although some legal experts dispute this claim). [fn 5] It extended its laws to the Golan Heights and East Jerusalem, but not the West Bank. Israel's occupation of the Palestinian territories is the world's longest military occupation in modern times. [fn 5] Efforts to resolve the Israeli–Palestinian conflict have not resulted in a final peace agreement. However, peace treaties between Israel and both Egypt and Jordan have been signed. In its Basic Laws, Israel defines itself as a Jewish and democratic state. The country has a liberal democracy, with a parliamentary system, proportional representation, and universal suffrage. The prime minister is head of government and the Knesset is the legislature. Israel is a developed country and an Organisation for Economic Co-operation and Development (OECD) member, with the 32nd-largest economy in the world by nominal gross domestic product (GDP) as of 2017[update]. The country benefits from a highly skilled workforce and is among the most educated countries in the world with one of the highest percentages of its citizens holding a tertiary education degree. Israel has the highest standard of living in the Middle East, and has one of the highest life expectancies in the world. Furthermore, Israel ranked 11th in the UN's 2018 World Happiness Report. Upon independence in 1948, the country formally adopted the name "State of Israel" (Hebrew: מְדִינַת יִשְׂרָאֵל Medīnat Yisrā'el [mediˈnat jisʁaˈʔel]; Arabic: دَوْلَة إِسْرَائِيل‎ Dawlat Isrāʼīl [dawlat ʔisraːˈʔiːl]) after other proposed historical and religious names including Eretz Israel ("the Land of Israel"), Zion, and Judea, were considered but rejected. In the early weeks of independence, the government chose the term "Israeli" to denote a citizen of Israel, with the formal announcement made by Minister of Foreign Affairs Moshe Sharett. The names Land of Israel and Children of Israel have historically been used to refer to the biblical Kingdom of Israel and the entire Jewish people respectively. The name "Israel" (Hebrew: Yisraʾel, Isrāʾīl; Septuagint Greek: Ἰσραήλ Israēl; 'El(God) persists/rules', though after Hosea 12:4 often interpreted as "struggle with God") in these phrases refers to the patriarch Jacob who, according to the Hebrew Bible, was given the name after he successfully wrestled with the angel of the Lord. Jacob's twelve sons became the ancestors of the Israelites, also known as the Twelve Tribes of Israel or Children of Israel. Jacob and his sons had lived in Canaan but were forced by famine to go into Egypt for four generations, lasting 430 years, until Moses, a great-great grandson of Jacob, led the Israelites back into Canaan during the "Exodus". 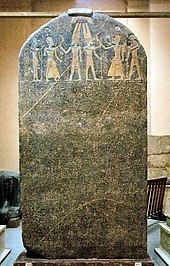 The earliest known archaeological artifact to mention the word "Israel" as a collective is the Merneptah Stele of ancient Egypt (dated to the late 13th century BCE). The area is also known as the Holy Land, being holy for all Abrahamic religions including Judaism, Christianity, Islam and the Bahá'í Faith. 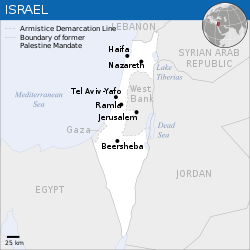 Under British Mandate (1920–1948), the whole region was known as Palestine (Hebrew: פלשתינה [א״י]‎, lit. 'Palestine [Eretz Israel]'). Through the centuries, the territory was known by a variety of other names, including Canaan, Djahy, Samaria, Judea, Yehud, Iudaea, Coele-Syria, Syria Palaestina and Southern Syria. The oldest evidence of early humans in the territory of modern Israel, dating to 1.5 million years ago, was found in Ubeidiya near the Sea of Galilee. Other notable Paleolithic sites include the caves Tabun, Qesem and Manot. The oldest fossils of anatomically modern humans found outside Africa are the Skhul and Qafzeh hominins, who lived in the area that is now northern Israel 120,000 years ago. Around 10th millennium BCE, the Natufian culture existed in the area. The early history of the territory is unclear. :104 Modern archaeology has largely discarded the historicity of the narrative in the Torah concerning the patriarchs, The Exodus, and the conquest of Canaan described in the Book of Joshua, and instead views the narrative as constituting the Israelites' national myth. During the Late Bronze Age (1550–1200 BCE), large parts of Canaan formed vassal states paying tribute to the New Kingdom of Egypt, whose administrative headquarters lay in Gaza. Ancestors of the Israelites are thought to have included ancient Semitic-speaking peoples native to this area. :78–79 The Israelites and their culture, according to the modern archaeological account, did not overtake the region by force, but instead branched out of these Canaanite peoples and their cultures through the development of a distinct monolatristic—and later monotheistic—religion centered on Yahweh. The archaeological evidence indicates a society of village-like centres, but with more limited resources and a small population. Villages had populations of up to 300 or 400, which lived by farming and herding, and were largely self-sufficient; economic interchange was prevalent. Writing was known and available for recording, even in small sites. While it is unclear if there was ever a United Monarchy, there is well accepted archeological evidence referring to "Israel" in the Merneptah Stele which dates to about 1200 BCE; and the Canaanites are archaeologically attested in the Middle Bronze Age (2100–1550 BCE). There is debate about the earliest existence of the Kingdoms of Israel and Judah and their extent and power, but historians agree that a Kingdom of Israel existed by ca. 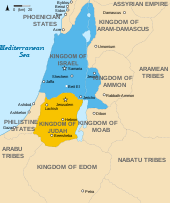 900 BCE:169–195 and that a Kingdom of Judah existed by ca. 700 BCE. The Kingdom of Israel was destroyed around 720 BCE, when it was conquered by the Neo-Assyrian Empire. 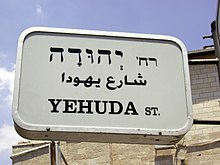 With successive Persian rule, the autonomous province Yehud Medinata was gradually developing back into urban society, largely dominated by Judeans. The Greek conquests largely skipped the region without any resistance or interest. Incorporated into the Ptolemaic and finally the Seleucid empires, the southern Levant was heavily hellenized, building the tensions between Judeans and Greeks. The conflict erupted in 167 BCE with the Maccabean Revolt, which succeeded in establishing an independent Hasmonean Kingdom in Judah, which later expanded over much of modern Israel, as the Seleucids gradually lost control in the region. The Roman Empire invaded the region in 63 BCE, first taking control of Syria, and then intervening in the Hasmonean Civil War. The struggle between pro-Roman and pro-Parthian factions in Judea eventually led to the installation of Herod the Great and consolidation of the Herodian kingdom as a vassal Judean state of Rome. With the decline of the Herodian dynasty, Judea, transformed into a Roman province, became the site of a violent struggle of Jews against Greco-Romans, culminating in the Jewish–Roman wars, ending in wide-scale destruction, expulsions, and genocide. Jewish presence in the region significantly dwindled after the failure of the Bar Kokhba revolt against the Roman Empire in 132 CE. Nevertheless, there was a continuous small Jewish presence and Galilee became its religious center. The Mishnah and part of the Talmud, central Jewish texts, were composed during the 2nd to 4th centuries CE in Tiberias and Jerusalem. The region came to be populated predominantly by Greco-Romans on the coast and Samaritans in the hill-country. Christianity was gradually evolving over Roman Paganism, when the area stood under Byzantine rule. Through the 5th and 6th centuries, the dramatic events of the repeated Samaritan revolts reshaped the land, with massive destruction to Byzantine Christian and Samaritan societies and a resulting decrease of the population. After the Persian conquest and the installation of a short-lived Jewish Commonwealth in 614 CE, the Byzantine Empire reconquered the country in 628. In 634–641 CE, the region, including Jerusalem, was conquered by the Arabs who had recently adopted Islam. Control of the region transferred between the Rashidun Caliphs, Umayyads, Abbasids, Fatimids, Seljuks, Crusaders, and Ayyubids throughout the next three centuries. During the siege of Jerusalem by the First Crusade in 1099, the Jewish inhabitants of the city fought side-by-side with the Fatimid garrison and the Muslim population who tried in vain to defend the city against the Crusaders. When the city fell, around 60,000 people were massacred, including 6,000 Jews seeking refuge in a synagogue. At this time, a full thousand years after the fall of the Jewish state, there were Jewish communities all over the country. Fifty of them are known and include Jerusalem, Tiberias, Ramleh, Ashkelon, Caesarea, and Gaza. According to Albert of Aachen, the Jewish residents of Haifa were the main fighting force of the city, and "mixed with Saracen [Fatimid] troops", they fought bravely for close to a month until forced into retreat by the Crusader fleet and land army. 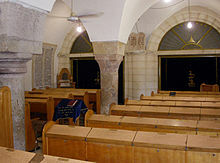 In 1165, Maimonides visited Jerusalem and prayed on the Temple Mount, in the "great, holy house." In 1141, the Spanish-Jewish poet Yehuda Halevi issued a call for Jews to migrate to the Land of Israel, a journey he undertook himself. In 1187, Sultan Saladin, founder of the Ayyubid dynasty, defeated the Crusaders in the Battle of Hattin and subsequently captured Jerusalem and almost all of Palestine. 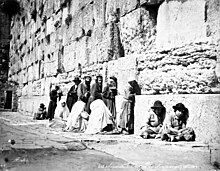 In time, Saladin issued a proclamation inviting Jews to return and settle in Jerusalem, and according to Judah al-Harizi, they did: "From the day the Arabs took Jerusalem, the Israelites inhabited it." Al-Harizi compared Saladin's decree allowing Jews to re-establish themselves in Jerusalem to the one issued by the Persian king Cyrus the Great over 1,600 years earlier. In 1211, the Jewish community in the country was strengthened by the arrival of a group headed by over 300 rabbis from France and England, among them Rabbi Samson ben Abraham of Sens. Nachmanides (Ramban), the 13th-century Spanish rabbi and recognised leader of Jewry, greatly praised the Land of Israel and viewed its settlement as a positive commandment incumbent on all Jews. He wrote "If the gentiles wish to make peace, we shall make peace and leave them on clear terms; but as for the land, we shall not leave it in their hands, nor in the hands of any nation, not in any generation." In 1260, control passed to the Mamluk sultans of Egypt. The country was located between the two centres of Mamluk power, Cairo and Damascus, and only saw some development along the postal road connecting the two cities. Jerusalem, although left without the protection of any city walls since 1219, also saw a flurry of new construction projects centred around the Al-Aqsa Mosque compound on the Temple Mount. In 1266, the Mamluk Sultan Baybars converted the Cave of the Patriarchs in Hebron into an exclusive Islamic sanctuary and banned Christians and Jews from entering, who previously had been able to enter it for a fee. The ban remained in place until Israel took control of the building in 1967. In 1470, Isaac b. Meir Latif arrived from Italy and counted 150 Jewish families in Jerusalem. Thanks to Joseph Saragossi who had arrived in the closing years of the 15th century, Safed and its environs had developed into the largest concentration of Jews in Palestine. With the help of the Sephardic immigration from Spain, the Jewish population had increased to 10,000 by the early 16th century. In 1516, the region was conquered by the Ottoman Empire; it remained under Turkish rule until the end of the First World War, when Britain defeated the Ottoman forces and set up a military administration across the former Ottoman Syria. In 1660, a Druze revolt led to the destruction of Safed and Tiberias. In late 18th century, local Arab Sheikh Zahir al-Umar created a de facto independent Emirate in the Galilee. Ottoman attempts to subdue the Sheikh failed, but after Zahir's death the Ottomans regained control of the area. In 1799 governor Jazzar Pasha successfully repelled an assault on Acre by troops of Napoleon, prompting the French to abandon the Syrian campaign. In 1834 a revolt by Palestinian Arab peasants broke out against Egyptian conscription and taxation policies under Muhammad Ali. Although the revolt was suppressed, Muhammad Ali's army retreated and Ottoman rule was restored with British support in 1840. Shortly after, the Tanzimat reforms were implemented across the Ottoman Empire. 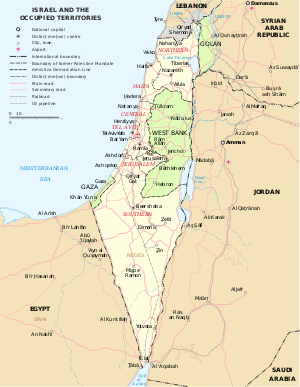 In 1920, after the Allies conquered the Levant during World War I, the territory was divided between Britain and France under the mandate system, and the British-administered area which included modern day Israel was named Mandatory Palestine. Since the existence of the earliest Jewish diaspora, many Jews have aspired to return to "Zion" and the "Land of Israel", though the amount of effort that should be spent towards such an aim was a matter of dispute. The hopes and yearnings of Jews living in exile are an important theme of the Jewish belief system. After the Jews were expelled from Spain in 1492, some communities settled in Palestine. During the 16th century, Jewish communities struck roots in the Four Holy Cities—Jerusalem, Tiberias, Hebron, and Safed—and in 1697, Rabbi Yehuda Hachasid led a group of 1,500 Jews to Jerusalem. In the second half of the 18th century, Eastern European opponents of Hasidism, known as the Perushim, settled in Palestine. "Therefore I believe that a wonderous generation of Jews will spring into existence. The Maccabaeans will rise again. Let me repeat once more my opening words: The Jews wish to have a State, and they shall have one. We shall live at last as free men on our own soil, and die peacefully in our own home. The world will be freed by our liberty, enriched by our wealth, magnified by our greatness. And whatever we attempt there to accomplish for our own welfare will react with beneficent force for the good of humanity." The first wave of modern Jewish migration to Ottoman-ruled Palestine, known as the First Aliyah, began in 1881, as Jews fled pogroms in Eastern Europe. Although the Zionist movement already existed in practice, Austro-Hungarian journalist Theodor Herzl is credited with founding political Zionism, a movement that sought to establish a Jewish state in the Land of Israel, thus offering a solution to the so-called Jewish question of the European states, in conformity with the goals and achievements of other national projects of the time. In 1896, Herzl published Der Judenstaat (The Jewish State), offering his vision of a future Jewish state; the following year he presided over the First Zionist Congress. The Second Aliyah (1904–14), began after the Kishinev pogrom; some 40,000 Jews settled in Palestine, although nearly half of them left eventually. Both the first and second waves of migrants were mainly Orthodox Jews, although the Second Aliyah included socialist groups who established the kibbutz movement. During World War I, British Foreign Secretary Arthur Balfour sent the Balfour Declaration of 1917 to Baron Rothschild (Walter Rothschild, 2nd Baron Rothschild), a leader of the British Jewish community, that stated that Britain intended for the creation of a Jewish "national home" within the Palestinian Mandate. In 1918, the Jewish Legion, a group primarily of Zionist volunteers, assisted in the British conquest of Palestine. Arab opposition to British rule and Jewish immigration led to the 1920 Palestine riots and the formation of a Jewish militia known as the Haganah (meaning "The Defense" in Hebrew), from which the Irgun and Lehi, or the Stern Gang, paramilitary groups later split off. In 1922, the League of Nations granted Britain a mandate over Palestine under terms which included the Balfour Declaration with its promise to the Jews, and with similar provisions regarding the Arab Palestinians. The population of the area at this time was predominantly Arab and Muslim, with Jews accounting for about 11%, and Arab Christians about 9.5% of the population. The Third (1919–23) and Fourth Aliyahs (1924–29) brought an additional 100,000 Jews to Palestine. The rise of Nazism and the increasing persecution of Jews in 1930s Europe led to the Fifth Aliyah, with an influx of a quarter of a million Jews. This was a major cause of the Arab revolt of 1936–39 during which the British Mandate authorities alongside the Zionist militias of Haganah and Irgun killed 5,032 Arabs and wounded 14,760, resulting in over ten percent of the adult male Palestinian Arab population killed, wounded, imprisoned or exiled. The British introduced restrictions on Jewish immigration to Palestine with the White Paper of 1939. With countries around the world turning away Jewish refugees fleeing the Holocaust, a clandestine movement known as Aliyah Bet was organized to bring Jews to Palestine. By the end of World War II, the Jewish population of Palestine had increased to 33% of the total population. After World War II, Britain found itself in intense conflict with the Jewish community over Jewish immigration limits, as well as continued conflict with the Arab community over limit levels. The Haganah joined Irgun and Lehi in an armed struggle against British rule. At the same time, hundreds of thousands of Jewish Holocaust survivors and refugees sought a new life far from their destroyed communities in Europe. The Yishuv attempted to bring these refugees to Palestine but many were turned away or rounded up and placed in detention camps in Atlit and Cyprus by the British. On 22 July 1946, Irgun attacked the British administrative headquarters for Palestine, which was housed in the southern wing of the King David Hotel in Jerusalem. A total of 91 people of various nationalities were killed and 46 were injured. The hotel was the site of the Secretariat of the Government of Palestine and the Headquarters of the British Armed Forces in Palestine and Transjordan. The attack initially had the approval of the Haganah. It was conceived as a response to Operation Agatha (a series of widespread raids, including one on the Jewish Agency, conducted by the British authorities) and was the deadliest directed at the British during the Mandate era. It was characterized as one of the "most lethal terrorist incidents of the twentieth century." In 1947, the British government announced it would withdraw from Palestine, stating it was unable to arrive at a solution acceptable to both Arabs and Jews. On 15 May 1947, the General Assembly of the newly formed United Nations resolved that the United Nations Special Committee on Palestine be created "to prepare for consideration at the next regular session of the Assembly a report on the question of Palestine." 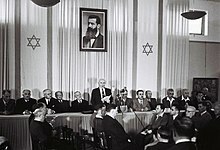 In the Report of the Committee dated 3 September 1947 to the General Assembly, the majority of the Committee in Chapter VI proposed a plan to replace the British Mandate with "an independent Arab State, an independent Jewish State, and the City of Jerusalem [...] the last to be under an International Trusteeship System." On 29 November 1947, the General Assembly adopted Resolution 181 (II) recommending the adoption and implementation of the Plan of Partition with Economic Union. The plan attached to the resolution was essentially that proposed by the majority of the Committee in the report of 3 September. The Jewish Agency, which was the recognized representative of the Jewish community, accepted the plan. The Arab League and Arab Higher Committee of Palestine rejected it, and indicated that they would reject any other plan of partition. On the following day, 1 December 1947, the Arab Higher Committee proclaimed a three-day strike, and Arab gangs began attacking Jewish targets. The Jews were initially on the defensive as civil war broke out, but in early April 1948 moved onto the offensive. The Arab Palestinian economy collapsed and 250,000 Palestinian Arabs fled or were expelled. On 14 May 1948, the day before the expiration of the British Mandate, David Ben-Gurion, the head of the Jewish Agency, declared "the establishment of a Jewish state in Eretz-Israel, to be known as the State of Israel." The only reference in the text of the Declaration to the borders of the new state is the use of the term Eretz-Israel ("Land of Israel"). The following day, the armies of four Arab countries—Egypt, Syria, Transjordan and Iraq—entered what had been British Mandatory Palestine, launching the 1948 Arab–Israeli War; contingents from Yemen, Morocco, Saudi Arabia and Sudan joined the war. The apparent purpose of the invasion was to prevent the establishment of the Jewish state at inception, and some Arab leaders talked about driving the Jews into the sea. According to Benny Morris, Jews felt that the invading Arab armies aimed to slaughter the Jews. The Arab league stated that the invasion was to restore law and order and to prevent further bloodshed. After a year of fighting, a ceasefire was declared and temporary borders, known as the Green Line, were established. Jordan annexed what became known as the West Bank, including East Jerusalem, and Egypt took control of the Gaza Strip. The UN estimated that more than 700,000 Palestinians were expelled by or fled from advancing Israeli forces during the conflict—what would become known in Arabic as the Nakba ("catastrophe"). Some 156,000 remained and became Arab citizens of Israel. Israel was admitted as a member of the UN by majority vote on 11 May 1949. Both Israel and Jordan were genuinely interested in a peace agreement but the British acted as a brake on the Jordanian effort in order to avoid damaging British interests in Egypt. In the early years of the state, the Labor Zionist movement led by Prime Minister David Ben-Gurion dominated Israeli politics. The kibbutzim, or collective farming communities, played a pivotal role in establishing the new state. Immigration to Israel during the late 1940s and early 1950s was aided by the Israeli Immigration Department and the non-government sponsored Mossad LeAliyah Bet (lit. "Institute for Immigration B") which organized illegal and clandestine immigration. Both groups facilitated regular immigration logistics like arranging transportation, but the latter also engaged in clandestine operations in countries, particularly in the Middle East and Eastern Europe, where the lives of Jews were believed to be in danger and exit from those places was difficult. Mossad LeAliyah Bet was disbanded in 1953. The immigration was in accordance with the One Million Plan. The immigrants came for differing reasons: some held Zionist beliefs or came for the promise of a better life in Israel, while others moved to escape persecution or were expelled. An influx of Holocaust survivors and Jews from Arab and Muslim countries to Israel during the first three years increased the number of Jews from 700,000 to 1,400,000. By 1958, the population of Israel rose to two million. Between 1948 and 1970, approximately 1,150,000 Jewish refugees relocated to Israel. Some new immigrants arrived as refugees with no possessions and were housed in temporary camps known as ma'abarot; by 1952, over 200,000 people were living in these tent cities. Jews of European background were often treated more favorably than Jews from Middle Eastern and North African countries—housing units reserved for the latter were often re-designated for the former, with the result that Jews newly arrived from Arab lands generally ended up staying in transit camps for longer. Tensions that developed between the two groups over such discrimination persist to the present day. During this period, food, clothes and furniture had to be rationed in what became known as the austerity period. The need to solve the crisis led Ben-Gurion to sign a reparations agreement with West Germany that triggered mass protests by Jews angered at the idea that Israel could accept monetary compensation for the Holocaust. During the 1950s, Israel was frequently attacked by Palestinian fedayeen, nearly always against civilians, mainly from the Egyptian-occupied Gaza Strip, leading to several Israeli counter-raids. In 1956, Great Britain and France aimed at regaining control of the Suez Canal, which the Egyptians had nationalized. The continued blockade of the Suez Canal and Straits of Tiran to Israeli shipping, together with the growing amount of Fedayeen attacks against Israel's southern population, and recent Arab grave and threatening statements, prompted Israel to attack Egypt. Israel joined a secret alliance with Great Britain and France and overran the Sinai Peninsula but was pressured to withdraw by the UN in return for guarantees of Israeli shipping rights in the Red Sea via the Straits of Tiran and the Canal. The war, known as the Suez Crisis, resulted in significant reduction of Israeli border infiltration. In the early 1960s, Israel captured Nazi war criminal Adolf Eichmann in Argentina and brought him to Israel for trial. The trial had a major impact on public awareness of the Holocaust. 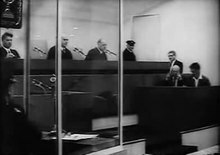 Eichmann remains the only person executed in Israel by conviction in an Israeli civilian court. Since 1964, Arab countries, concerned over Israeli plans to divert waters of the Jordan River into the coastal plain, had been trying to divert the headwaters to deprive Israel of water resources, provoking tensions between Israel on the one hand, and Syria and Lebanon on the other. Arab nationalists led by Egyptian President Gamal Abdel Nasser refused to recognize Israel, and called for its destruction. By 1966, Israeli-Arab relations had deteriorated to the point of actual battles taking place between Israeli and Arab forces. In May 1967, Egypt massed its army near the border with Israel, expelled UN peacekeepers, stationed in the Sinai Peninsula since 1957, and blocked Israel's access to the Red Sea. Other Arab states mobilized their forces. Israel reiterated that these actions were a casus belli and, on 5 June, launched a pre-emptive strike against Egypt. Jordan, Syria and Iraq responded and attacked Israel. In a Six-Day War, Israel defeated Jordan and captured the West Bank, defeated Egypt and captured the Gaza Strip and Sinai Peninsula, and defeated Syria and captured the Golan Heights. Jerusalem's boundaries were enlarged, incorporating East Jerusalem, and the 1949 Green Line became the administrative boundary between Israel and the occupied territories. Following the 1967 war and the "Three No's" resolution of the Arab League and during the 1967–1970 War of Attrition, Israel faced attacks from the Egyptians in the Sinai Peninsula, and from Palestinian groups targeting Israelis in the occupied territories, in Israel proper, and around the world. Most important among the various Palestinian and Arab groups was the Palestinian Liberation Organization (PLO), established in 1964, which initially committed itself to "armed struggle as the only way to liberate the homeland". In the late 1960s and early 1970s, Palestinian groups launched a wave of attacks against Israeli and Jewish targets around the world, including a massacre of Israeli athletes at the 1972 Summer Olympics in Munich. The Israeli government responded with an assassination campaign against the organizers of the massacre, a bombing and a raid on the PLO headquarters in Lebanon. On 6 October 1973, as Jews were observing Yom Kippur, the Egyptian and Syrian armies launched a surprise attack against Israeli forces in the Sinai Peninsula and Golan Heights, that opened the Yom Kippur War. The war ended on 25 October with Israel successfully repelling Egyptian and Syrian forces but having suffered over 2,500 soldiers killed in a war which collectively took 10–35,000 lives in about 20 days. An internal inquiry exonerated the government of responsibility for failures before and during the war, but public anger forced Prime Minister Golda Meir to resign. In July 1976, an airliner was hijacked during its flight from Israel to France by Palestinian guerrillas and landed at Entebbe, Uganda. Israeli commandos carried out an operation in which 102 out of 106 Israeli hostages were successfully rescued. The 1977 Knesset elections marked a major turning point in Israeli political history as Menachem Begin's Likud party took control from the Labor Party. Later that year, Egyptian President Anwar El Sadat made a trip to Israel and spoke before the Knesset in what was the first recognition of Israel by an Arab head of state. In the two years that followed, Sadat and Begin signed the Camp David Accords (1978) and the Israel–Egypt Peace Treaty (1979). In return, Israel withdrew from the Sinai Peninsula and agreed to enter negotiations over an autonomy for Palestinians in the West Bank and the Gaza Strip. On 11 March 1978, a PLO guerilla raid from Lebanon led to the Coastal Road massacre. Israel responded by launching an invasion of southern Lebanon to destroy the PLO bases south of the Litani River. Most PLO fighters withdrew, but Israel was able to secure southern Lebanon until a UN force and the Lebanese army could take over. The PLO soon resumed its policy of attacks against Israel. In the next few years, the PLO infiltrated the south and kept up a sporadic shelling across the border. Israel carried out numerous retaliatory attacks by air and on the ground. Israel's 1980 law declared that "Jerusalem, complete and united, is the capital of Israel." Meanwhile, Begin's government provided incentives for Israelis to settle in the occupied West Bank, increasing friction with the Palestinians in that area. The Basic Law: Jerusalem, Capital of Israel, passed in 1980, was believed by some to reaffirm Israel's 1967 annexation of Jerusalem by government decree, and reignited international controversy over the status of the city. No Israeli legislation has defined the territory of Israel and no act specifically included East Jerusalem therein. The position of the majority of UN member states is reflected in numerous resolutions declaring that actions taken by Israel to settle its citizens in the West Bank, and impose its laws and administration on East Jerusalem, are illegal and have no validity. In 1981 Israel annexed the Golan Heights, although annexation was not recognized internationally. Israel's population diversity expanded in the 1980s and 1990s. Several waves of Ethiopian Jews immigrated to Israel since the 1980s, while between 1990 and 1994, immigration from the post-Soviet states increased Israel's population by twelve percent. On 7 June 1981, the Israeli air force destroyed Iraq's sole nuclear reactor under construction just outside Baghdad, in order to impede Iraq's nuclear weapons program. Following a series of PLO attacks in 1982, Israel invaded Lebanon that year to destroy the bases from which the PLO launched attacks and missiles into northern Israel. In the first six days of fighting, the Israelis destroyed the military forces of the PLO in Lebanon and decisively defeated the Syrians. An Israeli government inquiry—the Kahan Commission—would later hold Begin, Sharon and several Israeli generals as indirectly responsible for the Sabra and Shatila massacre. In 1985, Israel responded to a Palestinian terrorist attack in Cyprus by bombing the PLO headquarters in Tunisia. Israel withdrew from most of Lebanon in 1986, but maintained a borderland buffer zone in southern Lebanon until 2000, from where Israeli forces engaged in conflict with Hezbollah. The First Intifada, a Palestinian uprising against Israeli rule, broke out in 1987, with waves of uncoordinated demonstrations and violence occurring in the occupied West Bank and Gaza. Over the following six years, the Intifada became more organised and included economic and cultural measures aimed at disrupting the Israeli occupation. More than a thousand people were killed in the violence. During the 1991 Gulf War, the PLO supported Saddam Hussein and Iraqi Scud missile attacks against Israel. Despite public outrage, Israel heeded American calls to refrain from hitting back and did not participate in that war. Shimon Peres (left) with Yitzhak Rabin (center) and King Hussein of Jordan (right), prior to signing the Israel–Jordan peace treaty in 1994. In 1992, Yitzhak Rabin became Prime Minister following an election in which his party called for compromise with Israel's neighbors. The following year, Shimon Peres on behalf of Israel, and Mahmoud Abbas for the PLO, signed the Oslo Accords, which gave the Palestinian National Authority the right to govern parts of the West Bank and the Gaza Strip. The PLO also recognized Israel's right to exist and pledged an end to terrorism. In 1994, the Israel–Jordan peace treaty was signed, making Jordan the second Arab country to normalize relations with Israel. Arab public support for the Accords was damaged by the continuation of Israeli settlements and checkpoints, and the deterioration of economic conditions. Israeli public support for the Accords waned as Israel was struck by Palestinian suicide attacks. In November 1995, while leaving a peace rally, Yitzhak Rabin was assassinated by Yigal Amir, a far-right-wing Jew who opposed the Accords. The site of the 2001 Tel Aviv Dolphinarium discotheque massacre, in which 21 Israelis were killed. Under the leadership of Benjamin Netanyahu at the end of the 1990s, Israel withdrew from Hebron, and signed the Wye River Memorandum, giving greater control to the Palestinian National Authority. Ehud Barak, elected Prime Minister in 1999, began the new millennium by withdrawing forces from Southern Lebanon and conducting negotiations with Palestinian Authority Chairman Yasser Arafat and U.S. President Bill Clinton at the 2000 Camp David Summit. During the summit, Barak offered a plan for the establishment of a Palestinian state. The proposed state included the entirety of the Gaza Strip and over 90% of the West Bank with Jerusalem as a shared capital. Each side blamed the other for the failure of the talks. After a controversial visit by Likud leader Ariel Sharon to the Temple Mount, the Second Intifada began. Some commentators contend that the uprising was pre-planned by Arafat due to the collapse of peace talks. Sharon became prime minister in a 2001 special election. During his tenure, Sharon carried out his plan to unilaterally withdraw from the Gaza Strip and also spearheaded the construction of the Israeli West Bank barrier, ending the Intifada. By this time 1,100 Israelis had been killed, mostly in suicide bombings. The Palestinian fatalities, from 2000 to 2008, reached 4,791 killed by Israeli security forces, 44 killed by Israeli civilians, and 609 killed by Palestinians. In July 2006, a Hezbollah artillery assault on Israel's northern border communities and a cross-border abduction of two Israeli soldiers precipitated the month-long Second Lebanon War. On 6 September 2007, the Israeli Air Force destroyed a nuclear reactor in Syria. At the end of 2008, Israel entered another conflict as a ceasefire between Hamas and Israel collapsed. The 2008–09 Gaza War lasted three weeks and ended after Israel announced a unilateral ceasefire. Hamas announced its own ceasefire, with its own conditions of complete withdrawal and opening of border crossings. Despite neither the rocket launchings nor Israeli retaliatory strikes having completely stopped, the fragile ceasefire remained in order. In what Israel described as a response to more than a hundred Palestinian rocket attacks on southern Israeli cities, Israel began an operation in Gaza on 14 November 2012, lasting eight days. Israel started another operation in Gaza following an escalation of rocket attacks by Hamas in July 2014. In September 2010, Israel was invited to join the OECD. Israel has also signed free trade agreements with the European Union, the United States, the European Free Trade Association, Turkey, Mexico, Canada, Jordan, and Egypt, and in 2007, it became the first non-Latin-American country to sign a free trade agreement with the Mercosur trade bloc. By 2010s, the increasing regional cooperation between Israel and Arab League countries, with many of whom peace agreements (Jordan, Egypt) diplomatic relations (UAE, Palestine) and unofficial relations (Bahrain, Saudi Arabia, Morocco, Tunisia), have been established, the Israeli security situation shifted from the traditional Arab–Israeli hostility towards regional rivalry with Iran and its proxies. The Iranian–Israeli conflict gradually emerged from the declared hostility of post-revolutionary Islamic Republic of Iran towards Israel since 1979, into covert Iranian support of Hezbollah during the South Lebanon conflict (1985–2000) and essentially developed into a proxy regional conflict from 2005. With increasing Iranian involvement in the Syrian Civil War from 2011 the conflict shifted from proxy warfare into direct confrontation by early 2018. The most catastrophic known earthquakes occurred in 31 BCE, 363, 749, and 1033 CE, that is every ca. 400 years on average. Destructive earthquakes leading to serious loss of life strike about every 80 years. While stringent construction regulations are currently in place and recently built structures are earthquake-safe, as of 2007[update] the majority of the buildings in Israel were older than these regulations and many public buildings as well as 50,000 residential buildings did not meet the new standards and were "expected to collapse" if exposed to a strong earthquake. As of 2019, Israel's population was at an estimated 8,995,640 people, of whom 74.5% were recorded by the civil government as Jews. Arabs comprised 20.9% of the population, while non-Arab Christians and people who have no religion listed in the civil registry made up 4.6%. Over the last decade, large numbers of migrant workers from Romania, Thailand, China, Africa, and South America have settled in Israel. Exact figures are unknown, as many of them are living in the country illegally, but estimates run in the region of 203,000. By June 2012, approximately 60,000 African migrants had entered Israel. About 92% of Israelis live in urban areas. Immigration to Israel in the years 1948–2015. The two peaks were in 1949 and 1990. Israel was established as a homeland for the Jewish people and is often referred to as a Jewish state. The country's Law of Return grants all Jews and those of Jewish ancestry the right to Israeli citizenship. Retention of Israel's population since 1948 is about even or greater, when compared to other countries with mass immigration. Jewish emigration from Israel (called yerida in Hebrew), primarily to the United States and Canada, is described by demographers as modest, but is often cited by Israeli government ministries as a major threat to Israel's future. Three quarters of the population are Jews from a diversity of Jewish backgrounds. Approximately 77% of Israeli Jews are born in Israel, 16% are immigrants from Europe and the Americas, and 7% are immigrants from Asia and Africa (including the Arab world). Jews from Europe and the former Soviet Union and their descendants born in Israel, including Ashkenazi Jews, constitute approximately 50% of Jewish Israelis. Jews who left or fled Arab and Muslim countries and their descendants, including both Mizrahi and Sephardi Jews, form most of the rest of the Jewish population. Jewish intermarriage rates run at over 35% and recent studies suggest that the percentage of Israelis descended from both Sephardi and Ashkenazi Jews increases by 0.5 percent every year, with over 25% of school children now originating from both communities. Around 4% of Israelis (300,000), ethnically defined as "others", are Russian descendants of Jewish origin or family who are not Jewish according to rabbinical law, but were eligible for Israeli citizenship under the Law of Return. The total number of Israeli settlers beyond the Green Line is over 600,000 (≈10% of the Jewish Israeli population). In 2016[update], 399,300 Israelis lived in West Bank settlements, including those that predated the establishment of the State of Israel and which were re-established after the Six-Day War, in cities such as Hebron and Gush Etzion bloc. In addition to the West Bank settlements, there were more than 200,000 Jews living in East Jerusalem, and 20,000 in the Golan Heights. Approximately 7,800 Israelis lived in settlements in the Gaza Strip, known as Gush Katif, until they were evacuated by the government as part of its 2005 disengagement plan. For a more comprehensive list, see List of cities in Israel. There are four major metropolitan areas: Gush Dan (Tel Aviv metropolitan area; population 3,854,000), Jerusalem metropolitan area (population 1,253,900), Haifa metropolitan area (population 924,400), and Beersheba metropolitan area (population 377,100). Israel's largest municipality, in population and area, is Jerusalem with 901,302 residents in an area of 125 square kilometres (48 sq mi). Israeli government statistics on Jerusalem include the population and area of East Jerusalem, which is widely recognized as part of the Palestinian territories under Israeli occupation. Tel Aviv and Haifa rank as Israel's next most populous cities, with populations of and 281,087, respectively. Israel has 16 cities with populations over 100,000. In all, there are 77 Israeli localities granted "municipalities" (or "city") status by the Ministry of the Interior, four of which are in the West Bank. Two more cities are planned: Kasif, a planned city to be built in the Negev, and Harish, originally a small town that is being built into a large city since 2015. ^a This number includes East Jerusalem and West Bank areas. Israeli sovereignty over East Jerusalem is internationally unrecognized. Israel has one official language, Hebrew. Arabic previously had been considered an official language of the State of Israel; in 2018 it was classified as having a 'special status in the state' with its use by state institutions to be set in law. Hebrew is the primary language of the state and is spoken every day by the majority of the population. Arabic is spoken by the Arab minority, with Hebrew taught in Arab schools. As a country of immigrants, many languages can be heard on the streets. Due to mass immigration from the former Soviet Union and Ethiopia (some 130,000 Ethiopian Jews live in Israel), Russian and Amharic are widely spoken. More than one million Russian-speaking immigrants arrived in Israel from the post-Soviet states between 1990 and 2004. French is spoken by around 700,000 Israelis, mostly originating from France and North Africa (see Maghrebi Jews). English was an official language during the Mandate period; it lost this status after the establishment of Israel, but retains a role comparable to that of an official language, as may be seen in road signs and official documents. Many Israelis communicate reasonably well in English, as many television programs are broadcast in English with subtitles and the language is taught from the early grades in elementary school. In addition, Israeli universities offer courses in the English language on various subjects. Israel comprises a major part of the Holy Land, a region of significant importance to all Abrahamic religions – Judaism, Christianity, Islam, Druze and Bahá'í Faith. The religious affiliation of Israeli Jews varies widely: a social survey from 2016 made by Pew Research indicates that 49% self-identify as Hiloni (secular), 29% as Masorti (traditional), 13% as Dati (religious) and 9% as Haredi (ultra-Orthodox). Haredi Jews are expected to represent more than 20% of Israel's Jewish population by 2028. Making up 17.6% of the population, Muslims constitute Israel's largest religious minority. About 2% of the population is Christian and 1.6% is Druze. The Christian population primarily comprises Arab Christians, but also includes post-Soviet immigrants, the foreign laborers of multinational origins, and followers of Messianic Judaism, considered by most Christians and Jews to be a form of Christianity. Members of many other religious groups, including Buddhists and Hindus, maintain a presence in Israel, albeit in small numbers. Out of more than one million immigrants from the former Soviet Union, about 300,000 are considered not Jewish by the Chief Rabbinate of Israel. 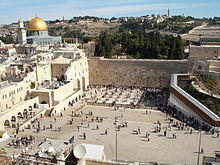 The city of Jerusalem is of special importance to Jews, Muslims and Christians as it is the home of sites that are pivotal to their religious beliefs, such as the Old City that incorporates the Western Wall and the Temple Mount, the Al-Aqsa Mosque and the Church of the Holy Sepulchre. Other locations of religious importance in Israel are Nazareth (holy in Christianity as the site of the Annunciation of Mary), Tiberias and Safed (two of the Four Holy Cities in Judaism), the White Mosque in Ramla (holy in Islam as the shrine of the prophet Saleh), and the Church of Saint George in Lod (holy in Christianity and Islam as the tomb of Saint George or Al Khidr). A number of other religious landmarks are located in the West Bank, among them Joseph's Tomb in Nablus, the birthplace of Jesus and Rachel's Tomb in Bethlehem, and the Cave of the Patriarchs in Hebron. The administrative center of the Bahá'í Faith and the Shrine of the Báb are located at the Bahá'í World Centre in Haifa; the leader of the faith is buried in Acre. A few miles south of the Bahá'í World Centre is Mahmood Mosque affiliated with the reformist Ahmadiyya movement. Kababir, Haifa's mixed neighbourhood of Jews and Ahmadi Arabs is the only one of its kind in the country. Education is highly valued in the Israeli culture and was viewed as a fundamental block of ancient Israelites. Jewish communities in the Levant were the first to introduce compulsory education for which the organized community, not less than the parents was responsible. Many international business leaders such as Microsoft founder Bill Gates have praised Israel for its high quality of education in helping spur Israel's economic development and technological boom. In 2015, the country ranked third among OECD members (after Canada and Japan) for the percentage of 25–64 year-olds that have attained tertiary education with 49% compared with the OECD average of 35%. In 2012, the country ranked third in the world in the number of academic degrees per capita (20 percent of the population). Israel has a school life expectancy of 16 years and a literacy rate of 97.8%. The State Education Law, passed in 1953, established five types of schools: state secular, state religious, ultra orthodox, communal settlement schools, and Arab schools. The public secular is the largest school group, and is attended by the majority of Jewish and non-Arab pupils in Israel. Most Arabs send their children to schools where Arabic is the language of instruction. Education is compulsory in Israel for children between the ages of three and eighteen. Schooling is divided into three tiers – primary school (grades 1–6), middle school (grades 7–9), and high school (grades 10–12) – culminating with Bagrut matriculation exams. Proficiency in core subjects such as mathematics, the Hebrew language, Hebrew and general literature, the English language, history, Biblical scripture and civics is necessary to receive a Bagrut certificate. Israel's Jewish population maintains a relatively high level of educational attainment where just under half of all Israeli Jews (46%) hold post-secondary degrees. This figure has remained stable in their already high levels of educational attainment over recent generations. Israeli Jews (among those ages 25 and older) have average of 11.6 years of schooling making them one of the most highly educated of all major religious groups in the world. In Arab, Christian and Druze schools, the exam on Biblical studies is replaced by an exam on Muslim, Christian or Druze heritage. Maariv described the Christian Arabs sectors as "the most successful in education system", since Christians fared the best in terms of education in comparison to any other religion in Israel. Israeli children from Russian-speaking families have a higher bagrut pass rate at high-school level. Amongst immigrant children born in the Former Soviet Union, the bagrut pass rate is higher amongst those families from European FSU states at 62.6% and lower amongst those from Central Asian and Caucasian FSU states. In 2014, 61.5% of all Israeli twelfth graders earned a matriculation certificate. Israel has a tradition of higher education where its quality university education has been largely responsible in spurring the nations modern economic development. Israel has nine public universities that are subsidized by the state and 49 private colleges. The Hebrew University of Jerusalem, Israel's second-oldest university after the Technion, houses the National Library of Israel, the world's largest repository of Judaica and Hebraica. The Technion and the Hebrew University consistently ranked among world's 100 top universities by the prestigious ARWU academic ranking. Other major universities in the country include the Weizmann Institute of Science, Tel Aviv University, Ben-Gurion University of the Negev, Bar-Ilan University, the University of Haifa and the Open University of Israel. Ariel University, in the West Bank, is the newest university institution, upgraded from college status, and the first in over thirty years. Israel is a parliamentary democracy with universal suffrage. A member of parliament supported by a parliamentary majority becomes the prime minister—usually this is the chair of the largest party. The prime minister is the head of government and head of the cabinet. Israel is governed by a 120-member parliament, known as the Knesset. Membership of the Knesset is based on proportional representation of political parties, with a 3.25% electoral threshold, which in practice has resulted in coalition governments. Residents of Israeli settlements in the West Bank are eligible to vote; in the most recent elections (2015), 10 of the 120 MKs were settlers. Parliamentary elections are scheduled every four years, but unstable coalitions or a no-confidence vote by the Knesset can dissolve a government earlier. The Basic Laws of Israel function as an uncodified constitution. In 2003, the Knesset began to draft an official constitution based on these laws. The president of Israel is head of state, with limited and largely ceremonial duties. Israel has no official religion, but the definition of the state as "Jewish and democratic" creates a strong connection with Judaism, as well as a conflict between state law and religious law. Interaction between the political parties keeps the balance between state and religion largely as it existed during the British Mandate. On 19 July 2018, the Israeli Parliament passed a Basic Law that characterizes the State of Israel as principally a "Nation State of the Jewish People," and Hebrew as its official language. The bill ascribes "special status" to the Arabic language. The same bill gives Jews a unique right to national self-determination, and views the developing of Jewish settlement in the country as "a national interest," empowering the government to "take steps to encourage, advance and implement this interest." Israel has a three-tier court system. At the lowest level are magistrate courts, situated in most cities across the country. Above them are district courts, serving as both appellate courts and courts of first instance; they are situated in five of Israel's six districts. The third and highest tier is the Supreme Court, located in Jerusalem; it serves a dual role as the highest court of appeals and the High Court of Justice. In the latter role, the Supreme Court rules as a court of first instance, allowing individuals, both citizens and non-citizens, to petition against the decisions of state authorities. Although Israel supports the goals of the International Criminal Court, it has not ratified the Rome Statute, citing concerns about the ability of the court to remain free from political impartiality. Israel's legal system combines three legal traditions: English common law, civil law, and Jewish law. It is based on the principle of stare decisis (precedent) and is an adversarial system, where the parties in the suit bring evidence before the court. Court cases are decided by professional judges rather than juries. Marriage and divorce are under the jurisdiction of the religious courts: Jewish, Muslim, Druze, and Christian. The election of judges is carried out by a committee of two Knesset members, three Supreme Court justices, two Israeli Bar members and two ministers (one of which, Israel's justice minister, is the committee's chairman). The committee's members of the Knesset are secretly elected by the Knesset, and one of them is traditionally a member of the opposition, the committee's Supreme Court justices are chosen by tradition from all Supreme Court justices by seniority, the Israeli Bar members are elected by the bar, and the second minister is appointed by the Israeli cabinet. The current justice minister and committee's chairwoman is Ayelet Shaked. Administration of Israel's courts (both the "General" courts and the Labor Courts) is carried by the Administration of Courts, situated in Jerusalem. Both General and Labor courts are paperless courts: the storage of court files, as well as court decisions, are conducted electronically. Israel's Basic Law: Human Dignity and Liberty seeks to defend human rights and liberties in Israel. As a result of "Enclave law", large portions of Israeli civil law are applied to Israeli settlements and Israeli residents in the occupied territories. 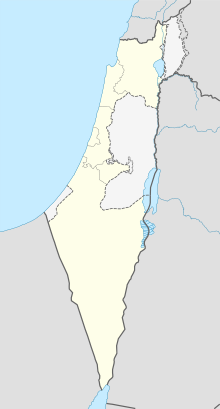 The State of Israel is divided into six main administrative districts, known as mehozot (Hebrew: מחוזות‎; singular: mahoz) – Center, Haifa, Jerusalem, North, South, and Tel Aviv districts, as well as the Judea and Samaria Area in the West Bank. All of the Judea and Samaria Area and parts of the Jerusalem and Northern districts are not recognized internationally as part of Israel. Districts are further divided into fifteen sub-districts known as nafot (Hebrew: נפות‎; singular: nafa), which are themselves partitioned into fifty natural regions. ^a Including over 200,000 Jews and 300,000 Arabs in East Jerusalem. In 1967, as a result of the Six-Day War, Israel captured and occupied the West Bank, including East Jerusalem, the Gaza Strip and the Golan Heights. 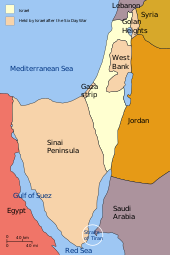 Israel also captured the Sinai Peninsula, but returned it to Egypt as part of the 1979 Egypt–Israel Peace Treaty. Between 1982 and 2000, Israel occupied part of southern Lebanon, in what was known as the Security Belt. Since Israel's capture of these territories, Israeli settlements and military installations have been built within each of them, except Lebanon. The Golan Heights and East Jerusalem have been fully incorporated into Israel under Israeli law, but not under international law. Israel has applied civilian law to both areas and granted their inhabitants permanent residency status and the ability to apply for citizenship. The UN Security Council has declared the annexation of the Golan Heights and East Jerusalem to be "null and void" and continues to view the territories as occupied. The status of East Jerusalem in any future peace settlement has at times been a difficult issue in negotiations between Israeli governments and representatives of the Palestinians, as Israel views it as its sovereign territory, as well as part of its capital. The West Bank excluding East Jerusalem is known in Israeli law as the Judea and Samaria Area; the almost 400,000 Israeli settlers residing in the area are considered part of Israel's population, have Knesset representation, a large part of Israel's civil and criminal laws applied to them, and their output is considered part of Israel's economy. [fn 3] The land itself is not considered part of Israel under Israeli law, as Israel has consciously refrained from annexing the territory, without ever relinquishing its legal claim to the land or defining a border with the area. There is no border between Israel-proper and the West Bank for Israeli vehicles. Israeli political opposition to annexation is primarily due to the perceived "demographic threat" of incorporating the West Bank's Palestinian population into Israel. Outside of the Israeli settlements, the West Bank remains under direct Israeli military rule, and Palestinians in the area cannot become Israeli citizens. The international community maintains that Israel does not have sovereignty in the West Bank, and considers Israel's control of the area to be the longest military occupation is modern history. The West Bank was occupied and annexed by Jordan in 1950, following the Arab rejection of the UN decision to create two states in Palestine. Only Britain recognized this annexation and Jordan has since ceded its claim to the territory to the PLO. The population are mainly Palestinians, including refugees of the 1948 Arab–Israeli War. From their occupation in 1967 until 1993, the Palestinians living in these territories were under Israeli military administration. Since the Israel–PLO letters of recognition, most of the Palestinian population and cities have been under the internal jurisdiction of the Palestinian Authority, and only partial Israeli military control, although Israel has on several occasions redeployed its troops and reinstated full military administration during periods of unrest. In response to increasing attacks during the Second Intifada, the Israeli government started to construct the Israeli West Bank barrier. When completed, approximately 13% of the barrier will be constructed on the Green Line or in Israel with 87% inside the West Bank. The Gaza Strip is considered to be a "foreign territory" under Israeli law; however, since Israel operates a land, air, and sea blockade of the Gaza Strip, together with Egypt, the international community considers Israel to be the occupying power. The Gaza Strip was occupied by Egypt from 1948 to 1967 and then by Israel after 1967. In 2005, as part of Israel's unilateral disengagement plan, Israel removed all of its settlers and forces from the territory, however, it continues to maintain control of its airspace and waters. The international community, including numerous international humanitarian organizations and various bodies of the UN, consider Gaza to remain occupied. Following the 2007 Battle of Gaza, when Hamas assumed power in the Gaza Strip, Israel tightened its control of the Gaza crossings along its border, as well as by sea and air, and prevented persons from entering and exiting the area except for isolated cases it deemed humanitarian. Gaza has a border with Egypt, and an agreement between Israel, the European Union, and the PA governed how border crossing would take place (it was monitored by European observers). Israel maintains diplomatic relations with 158 countries and has 107 diplomatic missions around the world; countries with whom they have no diplomatic relations include most Muslim countries. Only three members of the Arab League have normalized relations with Israel: Egypt and Jordan signed peace treaties in 1979 and 1994, respectively, and Mauritania opted for full diplomatic relations with Israel in 1999. Despite the peace treaty between Israel and Egypt, Israel is still widely considered an enemy country among Egyptians. Under Israeli law, Lebanon, Syria, Saudi Arabia, Iraq, Iran, Sudan, and Yemen are enemy countries, and Israeli citizens may not visit them without permission from the Ministry of the Interior. Iran had diplomatic relations with Israel under the Pahlavi dynasty but withdrew its recognition of Israel during the Islamic Revolution. As a result of the 2008–09 Gaza War, Mauritania, Qatar, Bolivia, and Venezuela suspended political and economic ties with Israel. China maintains good ties with both Israel and the Arab world. The United States and the Soviet Union were the first two countries to recognize the State of Israel, having declared recognition roughly simultaneously. Diplomatic relations with the Soviet Union were broken in 1967, following the Six-Day War, and renewed in October 1991. The United States regards Israel as its "most reliable partner in the Middle East," based on "common democratic values, religious affinities, and security interests". The United States has provided $68 billion in military assistance and $32 billion in grants to Israel since 1967, under the Foreign Assistance Act (period beginning 1962), more than any other country for that period until 2003. The United Kingdom is seen as having a "natural" relationship with Israel on account of the British Mandate for Palestine. Relations between the two countries were also made stronger by former prime minister Tony Blair's efforts for a two state resolution. By 2007[update], Germany had paid 25 billion euros in reparations to the Israeli state and individual Israeli Holocaust survivors. Israel is included in the European Union's European Neighbourhood Policy (ENP), which aims at bringing the EU and its neighbours closer. Although Turkey and Israel did not establish full diplomatic relations until 1991, Turkey has cooperated with the Jewish state since its recognition of Israel in 1949. Turkey's ties to the other Muslim-majority nations in the region have at times resulted in pressure from Arab and Muslim states to temper its relationship with Israel. Relations between Turkey and Israel took a downturn after the 2008–09 Gaza War and Israel's raid of the Gaza flotilla. Relations between Greece and Israel have improved since 1995 due to the decline of Israeli–Turkish relations. The two countries have a defense cooperation agreement and in 2010, the Israeli Air Force hosted Greece's Hellenic Air Force in a joint exercise at the Uvda base. The joint Cyprus-Israel oil and gas explorations centered on the Leviathan gas field are an important factor for Greece, given its strong links with Cyprus. Cooperation in the world's longest subsea electric power cable, the EuroAsia Interconnector, has strengthened relations between Cyprus and Israel. Azerbaijan is one of the few majority Muslim countries to develop bilateral strategic and economic relations with Israel. Azerbaijan supplies Israel with a substantial amount of its oil needs, and Israel has helped modernize the Armed Forces of Azerbaijan. India established full diplomatic ties with Israel in 1992 and has fostered a strong military, technological and cultural partnership with the country since then. According to an international opinion survey conducted in 2009 on behalf of the Israel Ministry of Foreign Affairs, India is the most pro-Israel country in the world. India is the largest customer of the Israeli military equipment and Israel is the second-largest military partner of India after Russia. Ethiopia is Israel's main ally in Africa due to common political, religious and security interests. Israel provides expertise to Ethiopia on irrigation projects and thousands of Ethiopian Jews live in Israel. Israel has a history of providing emergency aid and humanitarian response teams to disasters across the world. In 1955 Israel began its foreign aid program in Burma. The program's focus subsequently shifted to Africa. Israel's humanitarian efforts officially began in 1957, with the establishment of Mashav, the Israel's Agency for International Development Cooperation. In this early period, whilst Israel's aid represented only a small percentage of total aid to Africa, its program was effective in creating goodwill throughout the continent; however, following the 1967 war relations soured. Israel's foreign aid program subsequently shifted its focus to Latin America. Since the late 1970s Israel's foreign aid has gradually decreased. In recent years Israel has tried to reestablish its aid to Africa. There are additional Israeli humanitarian and emergency response groups that work with the Israel government, including IsraAid, a joint programme run by 14 Israeli organizations and North American Jewish groups, ZAKA, The Fast Israeli Rescue and Search Team (FIRST), Israeli Flying Aid (IFA), Save a Child's Heart (SACH) and Latet. Between 1985 and 2015, Israel sent 24 delegations of IDF search and rescue unit, the Home Front Command, to 22 countries. Currently Israeli foreign aid ranks low among OECD nations, spending less than 0.1% of its GNI on development assistance. The UN has set a target of 0.7%. In 2015 six nations reached the UN target. The country ranked 43rd in the 2016 World Giving Index. The Israel Defense Forces (IDF) is the sole military wing of the Israeli security forces, and is headed by its Chief of General Staff, the Ramatkal, subordinate to the Cabinet. The IDF consist of the army, air force and navy. It was founded during the 1948 Arab–Israeli War by consolidating paramilitary organizations—chiefly the Haganah—that preceded the establishment of the state. The IDF also draws upon the resources of the Military Intelligence Directorate (Aman), which works with Mossad and Shabak. The Israel Defense Forces have been involved in several major wars and border conflicts in its short history, making it one of the most battle-trained armed forces in the world. Most Israelis are drafted into the military at the age of 18. Men serve two years and eight months and women two years. 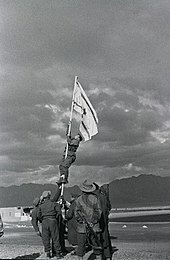 Following mandatory service, Israeli men join the reserve forces and usually do up to several weeks of reserve duty every year until their forties. Most women are exempt from reserve duty. Arab citizens of Israel (except the Druze) and those engaged in full-time religious studies are exempt from military service, although the exemption of yeshiva students has been a source of contention in Israeli society for many years. An alternative for those who receive exemptions on various grounds is Sherut Leumi, or national service, which involves a program of service in hospitals, schools and other social welfare frameworks. As a result of its conscription program, the IDF maintains approximately 176,500 active troops and an additional 445,000 reservists. Iron Dome is the world's first operational anti-artillery rocket defense system. The nation's military relies heavily on high-tech weapons systems designed and manufactured in Israel as well as some foreign imports. The Arrow missile is one of the world's few operational anti-ballistic missile systems. The Python air-to-air missile series is often considered one of the most crucial weapons in its military history. Israel's Spike missile is one of the most widely exported anti-tank guided missiles (ATGMs) in the world. Israel's Iron Dome anti-missile air defense system gained worldwide acclaim after intercepting hundreds of Qassam, 122 mm Grad and Fajr-5 artillery rockets fire by Palestinian militants from the Gaza Strip. Since the Yom Kippur War, Israel has developed a network of reconnaissance satellites. The success of the Ofeq program has made Israel one of seven countries capable of launching such satellites. Israel is widely believed to possess nuclear weapons as well as chemical and biological weapons of mass destruction. Israel has not signed the Treaty on the Non-Proliferation of Nuclear Weapons and maintains a policy of deliberate ambiguity toward its nuclear capabilities. The Israeli Navy's Dolphin submarines are believed to be armed with nuclear Popeye Turbo missiles, offering second-strike capability. Since the Gulf War in 1991, when Israel was attacked by Iraqi Scud missiles, all homes in Israel are required to have a reinforced security room, Merkhav Mugan, impermeable to chemical and biological substances. Since Israel's establishment, military expenditure constituted a significant portion of the country's gross domestic product, with peak of 30.3% of GDP spent on defense in 1975. In 2016, Israel ranked 6th in the world by defense spending as a percentage of GDP, with 5.7%, and 15th by total military expenditure, with $18 billion. Since 1974, the United States has been a particularly notable contributor of military aid to Israel. Under a memorandum of understanding signed in 2016, the U.S. is expected to provide the country with $3.8 billion per year, or around 20% of Israel's defense budget, from 2018 to 2028. Israel ranked 5th globally for arms exports in 2017. The majority of Israel's arms exports are unreported for security reasons. Israel is consistently rated low in the Global Peace Index, ranking 144th out of 163 nations for peacefulness in 2017. Israel is considered the most advanced country in Southwest Asia and the Middle East in economic and industrial development. Israel's quality university education and the establishment of a highly motivated and educated populace is largely responsible for spurring the country's high technology boom and rapid economic development. In 2010, it joined the OECD. The country is ranked 16th in the World Economic Forum's Global Competitiveness Report and 54th on the World Bank's Ease of Doing Business index. Israel was also ranked 5th in the world by share of people in high-skilled employment. Israeli economic data covers the economic territory of Israel, including the Golan Heights, East Jerusalem and Israeli settlements in the West Bank. Tel Aviv Stock Exchange. Its building is optimized for computer trading, with systems located in an underground bunker to keep the exchange active during emergencies. Despite limited natural resources, intensive development of the agricultural and industrial sectors over the past decades has made Israel largely self-sufficient in food production, apart from grains and beef. Imports to Israel, totaling $66.76 billion in 2017, include raw materials, military equipment, investment goods, rough diamonds, fuels, grain, and consumer goods. Leading exports include machinery and equipment, software, cut diamonds, agricultural products, chemicals, and textiles and apparel; in 2017, Israeli exports reached $60.6 billion. The Bank of Israel holds $113 billion of foreign-exchange reserves. Since the 1970s, Israel has received military aid from the United States, as well as economic assistance in the form of loan guarantees, which now account for roughly half of Israel's external debt. Israel has one of the lowest external debts in the developed world, and is a lender in terms of net external debt (assets vs. liabilities abroad), which in 2015[update] stood at a surplus of $69 billion. Israel has the second-largest number of startup companies in the world after the United States, and the third-largest number of NASDAQ-listed companies after the U.S. and China. 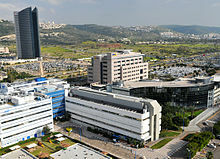 Intel and Microsoft built their first overseas research and development facilities in Israel, and other high-tech multi-national corporations, such as IBM, Google, Apple, Hewlett-Packard, Cisco Systems, Facebook and Motorola have opened research and development centres in the country. In 2007, American investor Warren Buffett's holding company Berkshire Hathaway bought an Israeli company, Iscar, its first acquisition outside the United States, for $4 billion. Days of working time in Israel are Sunday through Thursday (for a five-day workweek), or Friday (for a six-day workweek). In observance of Shabbat, in places where Friday is a work day and the majority of population is Jewish, Friday is a "short day", usually lasting until 14:00 in the winter, or 16:00 in the summer. Several proposals have been raised to adjust the work week with the majority of the world, and make Sunday a non-working day, while extending working time of other days or replacing Friday with Sunday as a work day. Israel's development of cutting-edge technologies in software, communications and the life sciences have evoked comparisons with Silicon Valley. Israel ranks 10th in the Bloomberg Innovation Index, and is 1st in the world in expenditure on research and development as a percentage of GDP. Israel boasts 140 scientists, technicians, and engineers per 10,000 employees, the highest number in the world (in comparison, the same is 85 for the U.S.). Israel has produced six Nobel Prize-winning scientists since 2004 and has been frequently ranked as one of the countries with the highest ratios of scientific papers per capita in the world. Israel has led the world in stem-cell research papers per capita since 2000. Israeli universities are ranked among the top 50 world universities in computer science (Technion and Tel Aviv University), mathematics (Hebrew University of Jerusalem) and chemistry (Weizmann Institute of Science). In 2012, Israel was ranked ninth in the world by the Futron's Space Competitiveness Index. The Israel Space Agency coordinates all Israeli space research programs with scientific and commercial goals, and have indigenously designed and built at least 13 commercial, research and spy satellites. Some of Israel's satellites are ranked among the world's most advanced space systems. Shavit is a space launch vehicle produced by Israel to launch small satellites into low Earth orbit. 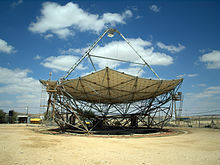 It was first launched in 1988, making Israel the eighth nation to have a space launch capability. In 2003, Ilan Ramon became Israel's first astronaut, serving as payload specialist of STS-107, the fatal mission of the Space Shuttle Columbia. The ongoing shortage of water in the country has spurred innovation in water conservation techniques, and a substantial agricultural modernization, drip irrigation, was invented in Israel. Israel is also at the technological forefront of desalination and water recycling. The Sorek desalination plant is the largest seawater reverse osmosis (SWRO) desalination facility in the world. By 2014, Israel's desalination programs provided roughly 35% of Israel's drinking water and it is expected to supply 40% by 2015 and 70% by 2050. As of 2015[update], more than 50 percent of the water for Israeli households, agriculture and industry is artificially produced. The country hosts an annual Water Technology and Environmental Control Exhibition & Conference (WATEC) that attracts thousands of people from across the world. In 2011, Israel's water technology industry was worth around $2 billion a year with annual exports of products and services in the tens of millions of dollars. As a result of innovations in reverse osmosis technology, Israel is set to become a net exporter of water in the coming years. Israel has embraced solar energy; its engineers are on the cutting edge of solar energy technology and its solar companies work on projects around the world. Over 90% of Israeli homes use solar energy for hot water, the highest per capita in the world. According to government figures, the country saves 8% of its electricity consumption per year because of its solar energy use in heating. The high annual incident solar irradiance at its geographic latitude creates ideal conditions for what is an internationally renowned solar research and development industry in the Negev Desert. Israel had a modern electric car infrastructure involving a countrywide network of charging stations to facilitate the charging and exchange of car batteries. It was thought that this would have lowered Israel's oil dependency and lowered the fuel costs of hundreds of Israel's motorists that use cars powered only by electric batteries. The Israeli model was being studied by several countries and being implemented in Denmark and Australia. However, Israel's trailblazing electric car company Better Place shut down in 2013. Israel has 19,224 kilometres (11,945 mi) of paved roads, and 3 million motor vehicles. The number of motor vehicles per 1,000 persons is 365, relatively low with respect to developed countries. Israel has 5,715 buses on scheduled routes, operated by several carriers, the largest of which is Egged, serving most of the country. Railways stretch across 1,277 kilometres (793 mi) and are operated solely by government-owned Israel Railways. Following major investments beginning in the early to mid-1990s, the number of train passengers per year has grown from 2.5 million in 1990, to 53 million in 2015; railways are also transporting 7.5 million tons of cargo, per year. 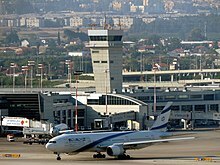 Israel is served by two international airports, Ben Gurion Airport, the country's main hub for international air travel near Tel Aviv, and Ovda Airport, which serves the southernmost port city of Eilat. There are several small domestic airports as well. Ben Gurion, Israel's largest airport, handled over 15 million passengers in 2015. On the Mediterranean coast, the Port of Haifa is the country's oldest and largest port, while Ashdod Port is one of the few deep water ports in the world built on the open sea. In addition to these, the smaller Port of Eilat is situated on the Red Sea, and is used mainly for trading with Far East countries. Tourism, especially religious tourism, is an important industry in Israel, with the country's temperate climate, beaches, archaeological, other historical and biblical sites, and unique geography also drawing tourists. Israel's security problems have taken their toll on the industry, but the number of incoming tourists is on the rebound. In 2017, a record of 3.6 million tourists visited Israel, yielding a 25 percent growth since 2016 and contributed NIS 20 billion to the Israeli economy. Israel began producing natural gas from its own offshore gas fields in 2004. Between 2005 and 2012, Israel had imported gas from Egypt via the al-Arish–Ashkelon pipeline, which was terminated due to Egyptian Crisis of 2011–14. In 2009, a natural gas reserve, Tamar, was found near the coast of Israel. A second natural gas reserve, Leviathan, was discovered in 2010. The natural gas reserves in these two fields (Leviathan has around 19 trillion cubic feet) could make Israel energy secure for more than 50 years. In 2013, Israel began commercial production of natural gas from the Tamar field. As of 2014[update], Israel produced over 7.5 billion cubic meters (bcm) of natural gas a year. Israel had 199 billion cubic meters (cu m) of proven reserves of natural gas as of the start of 2016. In early 2017, Israel began exporting natural gas to the Kingdom of Jordan. Ketura Sun is Israel's first commercial solar field. Built in early 2011 by the Arava Power Company on Kibbutz Ketura, Ketura Sun covers twenty acres and is expected to produce green energy amounting to 4.95 megawatts (MW). The field consists of 18,500 photovoltaic panels made by Suntech, which will produce about 9 gigawatt-hours (GWh) of electricity per year. In the next twenty years, the field will spare the production of some 125,000 metric tons of carbon dioxide. The field was inaugurated on 15 June 2011. On 22 May 2012 Arava Power Company announced that it had reached financial close on an additional 58.5 MW for 8 projects to be built in the Arava and the Negev valued at 780 million NIS or approximately $204 million. Israel's diverse culture stems from the diversity of its population. Jews from diaspora communities around the world brought their cultural and religious traditions back with them, creating a melting pot of Jewish customs and beliefs. Arab influences are present in many cultural spheres, such as architecture, music, and cuisine. Israel is the only country in the world where life revolves around the Hebrew calendar. Work and school holidays are determined by the Jewish holidays, and the official day of rest is Saturday, the Jewish Sabbath. Israeli literature is primarily poetry and prose written in Hebrew, as part of the renaissance of Hebrew as a spoken language since the mid-19th century, although a small body of literature is published in other languages, such as English. By law, two copies of all printed matter published in Israel must be deposited in the National Library of Israel at the Hebrew University of Jerusalem. In 2001, the law was amended to include audio and video recordings, and other non-print media. In 2016, 89 percent of the 7,300 books transferred to the library were in Hebrew. 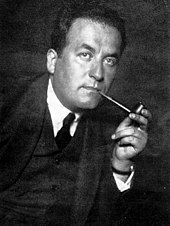 In 1966, Shmuel Yosef Agnon shared the Nobel Prize in Literature with German Jewish author Nelly Sachs. Leading Israeli poets have been Yehuda Amichai, Nathan Alterman, Leah Goldberg, and Rachel Bluwstein. Internationally famous contemporary Israeli novelists include Amos Oz, Etgar Keret and David Grossman. The Israeli-Arab satirist Sayed Kashua (who writes in Hebrew) is also internationally known. Israel has also been the home of Emile Habibi, whose novel The Secret Life of Saeed: The Pessoptimist, and other writings, won him the Israel prize for Arabic literature. Israeli music contains musical influences from all over the world; Mizrahi and Sephardic music, Hasidic melodies, Greek music, jazz, and pop rock are all part of the music scene. 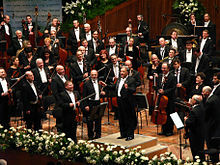 Among Israel's world-renowned orchestras is the Israel Philharmonic Orchestra, which has been in operation for over seventy years and today performs more than two hundred concerts each year. Itzhak Perlman, Pinchas Zukerman and Ofra Haza are among the internationally acclaimed musicians born in Israel. Israel has participated in the Eurovision Song Contest nearly every year since 1973, winning the competition four times and hosting it twice. Eilat has hosted its own international music festival, the Red Sea Jazz Festival, every summer since 1987. The nation's canonical folk songs, known as "Songs of the Land of Israel," deal with the experiences of the pioneers in building the Jewish homeland. Ten Israeli films have been final nominees for Best Foreign Language Film at the Academy Awards since the establishment of Israel. The 2009 movie Ajami was the third consecutive nomination of an Israeli film. Palestinian Israeli filmmakers have made a number of films dealing with the Arab-Israeli conflict and the status of Palestinians within Israel, such as Mohammed Bakri's 2002 film Jenin, Jenin and The Syrian Bride. Continuing the strong theatrical traditions of the Yiddish theatre in Eastern Europe, Israel maintains a vibrant theatre scene. Founded in 1918, Habima Theatre in Tel Aviv is Israel's oldest repertory theater company and national theater. The 2017 Freedom of the Press annual report by Freedom House ranked Israel as the Middle East and North Africa's most free country, and 64th globally. In the 2017 Press Freedom Index by Reporters Without Borders, Israel (including "Israel extraterritorial" since 2013 ranking) was placed 91st of 180 countries, first in the Middle East and North Africa region. For a more comprehensive list, see List of Israeli museums. The Israel Museum in Jerusalem is one of Israel's most important cultural institutions and houses the Dead Sea Scrolls, along with an extensive collection of Judaica and European art. Israel's national Holocaust museum, Yad Vashem, is the world central archive of Holocaust-related information. Beit Hatfutsot ("The Diaspora House"), on the campus of Tel Aviv University, is an interactive museum devoted to the history of Jewish communities around the world. Apart from the major museums in large cities, there are high-quality art spaces in many towns and kibbutzim. Mishkan LeOmanut in kibbutz Ein Harod Meuhad is the largest art museum in the north of the country. Israel has the highest number of museums per capita in the world. Several Israeli museums are devoted to Islamic culture, including the Rockefeller Museum and the L. A. Mayer Institute for Islamic Art, both in Jerusalem. The Rockefeller specializes in archaeological remains from the Ottoman and other periods of Middle East history. It is also the home of the first hominid fossil skull found in Western Asia, called Galilee Man. A cast of the skull is on display at the Israel Museum. Israeli cuisine includes local dishes as well as Jewish cuisine brought to the country by immigrants from the diaspora. Since the establishment of the state in 1948, and particularly since the late 1970s, an Israeli fusion cuisine has developed. Israeli cuisine has adopted, and continues to adapt, elements of the Mizrahi, Sephardi, and Ashkenazi styles of cooking. It incorporates many foods traditionally eaten in the Levantine, Arab, Middle Eastern and Mediterranean cuisines, such as falafel, hummus, shakshouka, couscous, and za'atar. Schnitzel, pizza, hamburgers, French fries, rice and salad are also common in Israel. Roughly half of the Israeli-Jewish population attests to keeping kosher at home. Kosher restaurants, though rare in the 1960s, make up around 25% of the total as of 2015[update], perhaps reflecting the largely secular values of those who dine out. Hotel restaurants are much more likely to serve kosher food. The non-kosher retail market was traditionally sparse, but grew rapidly and considerably following the influx of immigrants from the post-Soviet states during the 1990s. Together with non-kosher fish, rabbits and ostriches, pork—often called "white meat" in Israel—is produced and consumed, though it is forbidden by both Judaism and Islam. The most popular spectator sports in Israel are association football and basketball. The Israeli Premier League is the country's premier football league, and the Israeli Basketball Premier League is the premier basketball league. Maccabi Haifa, Maccabi Tel Aviv, Hapoel Tel Aviv and Beitar Jerusalem are the largest football clubs. Maccabi Tel Aviv, Maccabi Haifa and Hapoel Tel Aviv have competed in the UEFA Champions League and Hapoel Tel Aviv reached the UEFA Cup quarter-finals. Israel hosted and won the 1964 AFC Asian Cup; in 1970 the Israel national football team qualified for the FIFA World Cup, the only time it participated in the World Cup. The 1974 Asian Games, held in Tehran, were the last Asian Games in which Israel participated, plagued by the Arab countries that refused to compete with Israel. Israel was excluded from the 1978 Asian Games and since then has not competed in Asian sport events. In 1994, UEFA agreed to admit Israel, and its soccer teams now compete in Europe. Maccabi Tel Aviv B.C. has won the European championship in basketball six times. In 2016, the country was chosen as a host for the EuroBasket 2017. Chess is a leading sport in Israel and is enjoyed by people of all ages. There are many Israeli grandmasters and Israeli chess players have won a number of youth world championships. Israel stages an annual international championship and hosted the World Team Chess Championship in 2005. The Ministry of Education and the World Chess Federation agreed upon a project of teaching chess within Israeli schools, and it has been introduced into the curriculum of some schools. The city of Beersheba has become a national chess center, with the game being taught in the city's kindergartens. Owing partly to Soviet immigration, it is home to the largest number of chess grandmasters of any city in the world. The Israeli chess team won the silver medal at the 2008 Chess Olympiad and the bronze, coming in third among 148 teams, at the 2010 Olympiad. 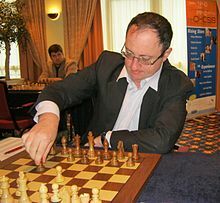 Israeli grandmaster Boris Gelfand won the Chess World Cup 2009 and the 2011 Candidates Tournament for the right to challenge the world champion. He only lost the World Chess Championship 2012 to reigning world champion Anand after a speed-chess tie breaker. Israel has won nine Olympic medals since its first win in 1992, including a gold medal in windsurfing at the 2004 Summer Olympics. Israel has won over 100 gold medals in the Paralympic Games and is ranked 20th in the all-time medal count. The 1968 Summer Paralympics were hosted by Israel. The Maccabiah Games, an Olympic-style event for Jewish and Israeli athletes, was inaugurated in the 1930s, and has been held every four years since then. Israeli tennis champion Shahar Pe'er ranked 11th in the world on 31 January 2011. Krav Maga, a martial art developed by Jewish ghetto defenders during the struggle against fascism in Europe, is used by the Israeli security forces and police. Its effectiveness and practical approach to self-defense, have won it widespread admiration and adherence around the world. ↑ Arabic previously had been considered an official language of the State of Israel. In 2018 it was classified as having a 'special status in the state' with its use by state institutions to be set in law. 1 2 3 4 5 6 7 8 9 Israeli population and economic data covers the economic territory of Israel, including the Golan Heights, East Jerusalem and Israeli settlements in the West Bank. ↑ The Jerusalem Law states that "Jerusalem, complete and united, is the capital of Israel" and the city serves as the seat of the government, home to the President's residence, government offices, supreme court, and parliament. United Nations Security Council Resolution 478 (20 August 1980; 14–0, U.S. abstaining) declared the Jerusalem Law "null and void" and called on member states to withdraw their diplomatic missions from Jerusalem (see Kellerman 1993, p. 140). See Status of Jerusalem for more information. 1 2 The majority of the international community (including the UN General Assembly, the United Nations Security Council, the European Union, the International Criminal Court, and the vast majority of human rights organizations) considers Israel to be occupying Gaza, the West Bank and East Jerusalem. Gaza is still considered to be "occupied" by the United Nations, international human rights organisations, and the majority of governments and legal commentators, despite the 2005 Israeli disengagement from Gaza, due to various forms of ongoing military and economic control. The government of Israel and some supporters have, at times, disputed this position of the international community. For more details of this terminology dispute, including with respect to the current status of the Gaza Strip, see International views on the Israeli-occupied territories and Status of territories captured by Israel. For an explanation of the differences between an annexed but disputed territory (e.g., Tibet) and a militarily occupied territory, please see the article Military occupation. ↑ "Australia recognises West Jerusalem as Israeli capital". BBC. 15 December 2018. ↑ "Foreign Ministry statement regarding Palestinian-Israeli settlement". www.mid.ru. 6 April 2017. ↑ "Czech Republic announces it recognizes West Jerusalem as Israel's capital". Jerusalem Post. 6 December 2017. Retrieved 6 December 2017. The Czech Republic currently, before the peace between Israel and Palestine is signed, recognizes Jerusalem to be in fact the capital of Israel in the borders of the demarcation line from 1967." The Ministry also said that it would only consider relocating its embassy based on "results of negotiations. ↑ "Guatemala se suma a EEUU y también trasladará su embajada en Israel a Jerusalén" [Guatemala joins US, will also move embassy to Jerusalem]. Infobae (in Spanish). 24 December 2017. Guatemala's embassy was located in Jerusalem until the 1980s, when it was moved to Tel Aviv. ↑ "Trump Recognizes Jerusalem as Israel's Capital and Orders U.S. Embassy to Move". The New York Times. 6 December 2017. Retrieved 6 December 2017. ↑ "Island nation Vanuatu recognizes Jerusalem as Israel's capital". Israel Hayom. 1 2 "Arabic in Israel: an official language and a cultural bridge". Israel Ministry of Foreign Affairs. 18 December 2016. Retrieved 8 August 2018. 1 2 "Israel Passes 'National Home' Law, Drawing Ire of Arabs". The New York Times. 19 July 2018. 1 2 Lubell, Maayan (19 July 2018). "Israel adopts divisive Jewish nation-state law". Reuters. 1 2 "Press Releases from the Knesset". Knesset website. 19 July 2018. The Arabic language has a special status in the state; Regulating the use of Arabic in state institutions or by them will be set in law. 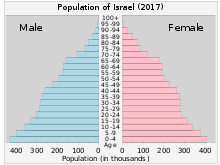 1 2 3 "Latest Population Statistics for Israel". Jewish Virtual Library. American–Israeli Cooperative Enterprise. Retrieved 16 April 2018. 1 2 3 4 5 6 7 8 9 10 "Israel". The World Factbook. Central Intelligence Agency. Retrieved 5 January 2017. 1 2 "Home page". Israel Central Bureau of Statistics. Retrieved 20 February 2017. ↑ Population Census 2008 (PDF) (Report). Israel Central Bureau of Statistics. 2008. Retrieved 27 December 2016. 1 2 "Report for Selected Countries and Subjects". International Monetary Fund. April 2018. Retrieved 19 April 2018. ↑ Quarterly Economic and Social Monitor, Volume 26, October 2011, p. 57: "When Israel bid in March 2010 for membership in the 'Organization for Economic Co-operation and Development'... some members questioned the accuracy of Israeli statistics, as the Israeli figures (relating to gross domestic product, spending and number of the population) cover geographical areas that the Organization does not recognize as part of the Israeli territory. 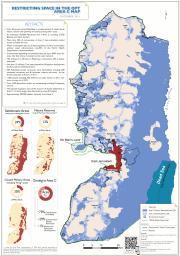 These areas include East Jerusalem, Israeli settlements in the West Bank and the Golan Heights." ↑ "Distribution of family income – Gini index". The World Factbook. Central Intelligence Agency. Retrieved 21 August 2017. 1 2 "Human Development Index and its components". United Nations Development Programme. 2018. Retrieved 24 September 2018. ↑ "Palestinian Territories". State.gov. 22 April 2008. Retrieved 26 December 2012. ↑ The Controversial Sovereignty over the City of Jerusalem (22 June 2015, The National Catholic Reporter) "No U.S. president has ever officially acknowledged Israeli sovereignty over any part of Jerusalem (...) The refusal to recognize Jerusalem as Israeli territory is a near universal policy among Western nations." ↑ Jerusalem: Opposition to mooted Trump Israel announcement grows"Israeli sovereignty over Jerusalem has never been recognised internationally"
↑ Whither Jerusalem (Lapidot) p. 17: "Israeli control in west Jerusalem since 1948 was illegal and most states have not recognized its sovereignty there"
1 2 Jonathan M Golden,Ancient Canaan and Israel: An Introduction, OUP, 2009 pp. 3–4. 1 2 3 4 5 Finkelstein, Israel; Silberman, Neil Asher (2001). The Bible unearthed : archaeology's new vision of ancient Israel and the origin of its stories (1st Touchstone ed.). New York: Simon & Schuster. ISBN 978-0-684-86912-4. 1 2 The Pitcher Is Broken: Memorial Essays for Gosta W. Ahlstrom, Steven W. Holloway, Lowell K. Handy, Continuum, 1 May 1995 Quote: "For Israel, the description of the battle of Qarqar in the Kurkh Monolith of Shalmaneser III (mid-ninth century) and for Judah, a Tiglath-pileser III text mentioning (Jeho-) Ahaz of Judah (IIR67 = K. 3751), dated 734-733, are the earliest published to date." 1 2 Broshi, Maguen (2001). Bread, Wine, Walls and Scrolls. Bloomsbury Publishing. p. 174. ISBN 978-1-84127-201-6. 1 2 "British Museum – Cuneiform tablet with part of the Babylonian Chronicle (605–594 BCE)". Archived from the original on 30 October 2014. Retrieved 30 October 2014. ↑ Jon L. Berquist (2007). Approaching Yehud: New Approaches to the Study of the Persian Period. Society of Biblical Lit. pp. 195–. ISBN 978-1-58983-145-2. 1 2 3 Peter Fibiger Bang; Walter Scheidel (2013). The Oxford Handbook of the State in the Ancient Near East and Mediterranean. Oxford University Press. pp. 184–187. ISBN 978-0-19-518831-8. ↑ Abraham Malamat (1976). A History of the Jewish People. Harvard University Press. pp. 223–239. ISBN 978-0-674-39731-6. ↑ Yohanan Aharoni (15 September 2006). The Jewish People: An Illustrated History. A&C Black. pp. 99–. ISBN 978-0-8264-1886-9. ↑ Erwin Fahlbusch; Geoffrey William Bromiley (2005). The Encyclopedia of Christianity. Wm. B. Eerdmans Publishing. pp. 15–. ISBN 978-0-8028-2416-5. 1 2 "Resolution 181 (II). Future government of Palestine". United Nations. 29 November 1947. Retrieved 21 March 2017. 1 2 Morris 2008, p. 66: at 1946 "The League demanded independence for Palestine as a "unitary" state, with an Arab majority and minority rights for the Jews. ", p. 67: at 1947 "The League's Political Committee met in Sofar, Lebanon, on 16–19 September, and urged the Palestine Arabs to fight partition, which it called "aggression," "without mercy." The League promised them, in line with Bludan, assistance "in manpower, money and equipment" should the United Nations endorse partition. ", p. 72: at December 1947 "The League vowed, in very general language, "to try to stymie the partition plan and prevent the establishment of a Jewish state in Palestine."" 1 2 Morris 2008, p. 75: "The night of 29–30 November passed in the Yishuv's settlements in noisy public rejoicing. Most had sat glued to their radio sets broadcasting live from Flushing Meadow. A collective cry of joy went up when the two-thirds mark was achieved: a state had been sanctioned by the international community." 1 2 3 Morris 2008, p. 396: "The immediate trigger of the 1948 War was the November 1947 UN partition resolution. The Zionist movement, except for its fringes, accepted the proposal. ", "The Arab war aim, in both stages of the hostilities, was, at a minimum, to abort the emergence of a Jewish state or to destroy it at inception. The Arab states hoped to accomplish this by conquering all or large parts of the territory allotted to the Jews by the United Nations. And some Arab leaders spoke of driving the Jews into the sea and ridding Palestine "of the Zionist plague." The struggle, as the Arabs saw it, was about the fate of Palestine/ the Land of Israel, all of it, not over this or that part of the country. But, in public, official Arab spokesmen often said that the aim of the May 1948 invasion was to "save" Palestine or "save the Palestinians," definitions more agreeable to Western ears." 1 2 "Declaration of Establishment of State of Israel". Israel Ministry of Foreign Affairs. 14 May 1948. Archived from the original on 17 March 2017. Retrieved 21 March 2017. ↑ Cuyckens, Hanne (1 October 2016). "Is Israel Still an Occupying Power in Gaza?". Netherlands International Law Review. 63 (3): 275–295. doi:10.1007/s40802-016-0070-1 – via link.springer.com. 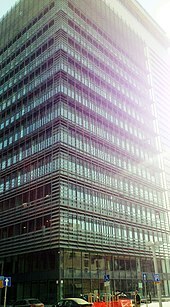 ↑ "Analysis: Kadima's big plans". BBC News. 29 March 2006. Retrieved 10 October 2010. ↑ Kumaraswamy, P.R. (5 June 2002). "The Legacy of Undefined Borders". Tel Aviv Notes. Retrieved 25 March 2013. Sanger, Andrew (2011). M.N. Schmitt; Louise Arimatsu; Tim McCormack, eds. The Contemporary Law of Blockade and the Gaza Freedom Flotilla. Yearbook of International Humanitarian Law 2010. Yearbook of International Humanitarian Law. 13. p. 429. doi:10.1007/978-90-6704-811-8_14. ISBN 978-90-6704-811-8. Israel claims it no longer occupies the Gaza Strip, maintaining that it is neither a Stale nor a territory occupied or controlled by Israel, but rather it has 'sui generis' status. Pursuant to the Disengagement Plan, Israel dismantled all military institutions and settlements in Gaza and there is no longer a permanent Israeli military or civilian presence in the territory. However the Plan also provided that Israel will guard and monitor the external land perimeter of the Gaza Strip, will continue to maintain exclusive authority in Gaza air space, and will continue to exercise security activity in the sea off the coast of the Gaza Strip as well as maintaining an Israeli military presence on the Egyptian-Gaza border. and reserving the right to reenter Gaza at will. Israel continues to control six of Gaza's seven land crossings, its maritime borders and airspace and the movement of goods and persons in and out of the territory. Egypt controls one of Gaza's land crossings. Troops from the Israeli Defence Force regularly enter pans of the territory and/or deploy missile attacks, drones and sonic bombs into Gaza. Israel has declared a no-go buffer zone that stretches deep into Gaza: if Gazans enter this zone they are shot on sight. Gaza is also dependent on israel for inter alia electricity, currency, telephone networks, issuing IDs, and permits to enter and leave the territory. Israel also has sole control of the Palestinian Population Registry through which the Israeli Army regulates who is classified as a Palestinian and who is a Gazan or West Banker. Since 2000 aside from a limited number of exceptions Israel has refused to add people to the Palestinian Population Registry. It is this direct external control over Gaza and indirect control over life within Gaza that has led the United Nations, the UN General Assembly, the UN Fact Finding Mission to Gaza, International human rights organisations, US Government websites, the UK Foreign and Commonwealth Office and a significant number of legal commentators, to reject the argument that Gaza is no longer occupied. Scobbie, Iain (2012). Elizabeth Wilmshurst, ed. International Law and the Classification of Conflicts. Oxford University Press. p. 295. ISBN 978-0-19-965775-9. Even after the accession to power of Hamas, Israel's claim that it no longer occupies Gaza has not been accepted by UN bodies, most States, nor the majority of academic commentators because of its exclusive control of its border with Gaza and crossing points including the effective control it exerted over the Rafah crossing until at least May 2011, its control of Gaza's maritime zones and airspace which constitute what Aronson terms the 'security envelope' around Gaza, as well as its ability to intervene forcibly at will in Gaza. Gawerc, Michelle (2012). Prefiguring Peace: Israeli-Palestinian Peacebuilding Partnerships. Lexington Books. p. 44. ISBN 978-0-7391-6610-9. While Israel withdrew from the immediate territory, Israel still controlled all access to and from Gaza through the border crossings, as well as through the coastline and the airspace. ln addition, Gaza was dependent upon Israel for water electricity sewage communication networks and for its trade (Gisha 2007. Dowty 2008). ln other words, while Israel maintained that its occupation of Gaza ended with its unilateral disengagement Palestinians – as well as many human right organizations and international bodies – argued that Gaza was by all intents and purposes still occupied. * Hajjar, Lisa (2005). Courting Conflict: The Israeli Military Court System in the West Bank and Gaza. University of California Press. p. 96. ISBN 978-0-520-24194-7. The Israeli occupation of the West Bank and Gaza is the longest military occupation in modern times. * Weill, Sharon (2014). The Role of National Courts in Applying International Humanitarian Law. Oxford University Press. p. 22. ISBN 978-0-19-968542-4. Although the basic philosophy behind the law of military occupation is that it is a temporary situation modem occupations have well demonstrated that rien ne dure comme le provisoire A significant number of post-1945 occupations have lasted more than two decades such as the occupations of Namibia by South Africa and of East Timor by Indonesia as well as the ongoing occupations of Northern Cyprus by Turkey and of Western Sahara by Morocco. The Israeli occupation of the Palestinian territories, which is the longest in all occupation's history has already entered its fifth decade. * Azarova, Valentina. 2017, Israel's Unlawfully Prolonged Occupation: Consequences under an Integrated Legal Framework, European Council on Foreign Affairs Policy Brief: "June 2017 marks 50 years of Israel's belligerent occupation of Palestinian territory, making it the longest occupation in modern history." ↑ Rummel 1997, p. 11. "A current list of liberal democracies includes: Andorra, Argentina, ..., Cyprus, ..., Israel, ..."
1 2 3 "Israel's accession to the OECD". Organisation for Economic Co-operation and Development. Retrieved 12 August 2012. 1 2 Education at a Glance: Israel (Report). Organisation for Economic Co-operation and Development. 15 September 2016. Retrieved 18 January 2017. ↑ Report, World Happiness (2018-03-14). "World Happiness Report 2018". World Happiness Report. Retrieved 2019-02-26. ↑ "Popular Opinion". The Palestine Post. Jerusalem. 7 December 1947. p. 1. Archived from the original on 15 August 2012. ↑ "On the Move". Time. New York. 31 May 1948. Archived from the original on 16 October 2007. Retrieved 6 August 2007. ↑ William G. Dever, Did God Have a Wife? : Archaeology and Folk Religion in Ancient Israel, Wm. B. Eerdmans Publishing, 2005 p. 186. ↑ Geoffrey W. Bromiley, 'Israel,' in International Standard Bible Encyclopedia: E–J,Wm. B. Eerdmans Publishing, 1995 p. 907. ↑ R.L. Ottley, The Religion of Israel: A Historical Sketch, Cambridge University Press, 2013 pp. 31–32 note 5. ↑ Wells, John C. (1990). Longman pronunciation dictionary. Harlow, England: Longman. p. 381. ISBN 978-0-582-05383-0. entry "Jacob". ↑ Tchernov, Eitan (1988). "The Age of 'Ubeidiya Formation (Jordan Valley, Israel) and the Earliest Hominids in the Levant". Paléorient. 14 (2): 63–65. doi:10.3406/paleo.1988.4455. Retrieved 4 January 2017. ↑ Rincon, Paul (14 October 2015). "Fossil teeth place humans in Asia '20,000 years early'". BBC News. Retrieved 4 January 2017. ↑ Bar-Yosef, Ofer (7 December 1998). "The Natufian Culture in the Levant, Threshold to the Origins of Agriculture" (PDF). Evolutionary Anthropology. 6 (5): 159–177. doi:10.1002/(SICI)1520-6505(1998)6:5<159::AID-EVAN4>3.0.CO;2-7. Retrieved 4 January 2017. ↑ Dever, William (2001). What Did the Biblical Writers Know, and When Did They Know It?. Eerdmans. pp. 98–99. ISBN 978-3-927120-37-2. After a century of exhaustive investigation, all respectable archaeologists have given up hope of recovering any context that would make Abraham, Isaac, or Jacob credible "historical figures" [...] archaeological investigation of Moses and the Exodus has similarly been discarded as a fruitless pursuit. ↑ Susan L. Braunstein, 'The Meaning of Egyptian-Style Objects in the Late Bronze Cemeteries of Tell el-Farʿah(South),' Bulletin of the American Schools of Oriental Research, No. 364 (November 2011), pp. 1–36 [1–2, 5]. ↑ Miller, James Maxwell; Hayes, John Haralson (1986). A History of Ancient Israel and Judah. Westminster John Knox Press. ISBN 978-0-664-21262-9. ↑ McNutt 1999, p. 35. ↑ Bloch-Smith, Elizabeth (2003). "Israelite Ethnicity in Iron I: Archaeology Preserves What Is Remembered and What Is Forgotten in Israel's History". Journal of Biblical Literature. 122 (3): 401–425. doi:10.2307/3268384. ISSN 0021-9231. JSTOR 3268384. ↑ Miller 2012, p. 98. ↑ Miller 2012, p. 99. ↑ Miller 2012, p. 105. ↑ Lipschits, Oded (2014). "The History of Israel in the Biblical Period". In Berlin, Adele; Brettler, Marc Zvi. The Jewish Study Bible (2nd ed.). Oxford University Press. ISBN 978-0-19-997846-5. 1 2 Kuhrt, Amiele (1995). The Ancient Near East. Routledge. p. 438. ISBN 978-0-415-16762-8. 1 2 Wright, Jacob L. (July 2014). "David, King of Judah (Not Israel)". The Bible and Interpretation. ↑ K.L. Noll, Canaan and Israel in Antiquity: A Textbook on History and Religion, A&C Black, 2012, rev.ed. pp. 137ff. ↑ The personal name "Israel" appears much earlier, in material from Ebla. Hasel, Michael G. (1 January 1994). "Israel in the Merneptah Stela". Bulletin of the American Schools of Oriental Research (296): 45–61. doi:10.2307/1357179. JSTOR 1357179. ; Bertman, Stephen (14 July 2005). Handbook to Life in Ancient Mesopotamia. OUP. ISBN 978-0-19-518364-1. and Meindert Dijkstra (2010). "Origins of Israel between history and ideology". In Becking, Bob; Grabbe, Lester. Between Evidence and Ideology Essays on the History of Ancient Israel read at the Joint Meeting of the Society for Old Testament Study and the Oud Testamentisch Werkgezelschap Lincoln, July 2009. Brill. p. 47. ISBN 978-90-04-18737-5. As a West Semitic personal name it existed long before it became a tribal or a geographical name. This is not without significance, though is it rarely mentioned. We learn of a maryanu named ysr"il (*Yi¡sr—a"ilu) from Ugarit living in the same period, but the name was already used a thousand years before in Ebla. The word Israel originated as a West Semitic personal name. One of the many names that developed into the name of the ancestor of a clan, of a tribe and finally of a people and a nation. ↑ Lemche, Niels Peter (1998). The Israelites in History and Tradition. Westminster John Knox Press. p. 35. ISBN 978-0-664-22727-2. ↑ "ABC 5 (Jerusalem Chronicle) – Livius". www.livius.org. 1 2 "Second Temple Period (538 BCE to 70 CE) Persian Rule". Biu.ac.il. Retrieved 15 March 2014. ↑ Grabbe, Lester L. (2004). A History of the Jews and Judaism in the Second Temple Period: Yehud – A History of the Persian Province of Judah v. 1. T & T Clark. p. 355. ISBN 978-0-567-08998-4. ↑ Lehmann, Clayton Miles (18 January 2007). "Palestine". Encyclopedia of the Roman Provinces. University of South Dakota. Archived from the original on 7 April 2013. Retrieved 9 February 2013. ↑ Gil, Moshe (1997). A History of Palestine, 634–1099. Cambridge University Press. ISBN 978-0-521-59984-9. ↑ Geoffrey Hindley (2007). Saladin: hero of Islam. Pen & Sword Military. p. xiii. ISBN 978-1-84415-499-9. Retrieved 26 December 2011. ↑ Moshe Lichtman (2006). Eretz Yisrael in the Parshah: The Centrality of the Land of Israel in the Torah. Devora Publishing. p. 302. ISBN 978-1-932687-70-5. Retrieved 23 December 2011. 1 2 Kramer, Gudrun (2008). A History of Palestine: From the Ottoman Conquest to the Founding of the State of Israel. Princeton University Press. p. 376. ISBN 978-0-691-11897-0. ↑ Fannie Fern Andrews (1976). The Holy Land under mandate. Hyperion Press. p. 145. ISBN 978-0-88355-304-6. Retrieved 25 December 2011. ↑ Joel Rappel, History of Eretz Israel from Prehistory up to 1882 (1980), vol. 2, p. 531. 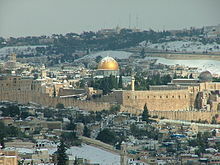 "In 1662 Sabbathai Sevi arrived to Jerusalem. It was the time when the Jewish settlements of Galilee were destroyed by the Druze: Tiberias was completely desolate and only a few of former Safed residents had returned...."
↑ "Palestine – Ottoman rule". www.britannica.com. Encyclopedia Britannica. Retrieved 27 November 2018. ↑ Eisen, Yosef (2004). Miraculous journey: a complete history of the Jewish people from creation to the present. Targum Press. p. 700. ISBN 978-1-56871-323-6. ↑ Morgenstern, Arie (2006). Hastening redemption: Messianism and the resettlement of the land of Israel. Oxford University Press. p. 304. ISBN 978-0-19-530578-4. 1 2 3 4 "Immigration to Israel". Jewish Virtual Library. Retrieved 29 March 2012. The source provides information on the First, Second, Third, Fourth and Fifth Aliyot in their respective articles. The White Paper leading to Aliyah Bet is discussed "Aliyah During World War II and its Aftermath". ↑ "Chapter One". The Jewish Agency for Israel1. 2005-07-21. Retrieved 21 September 2015. ↑ Yapp, M.E. (1987). The Making of the Modern Near East 1792–1923. Harlow, England: Longman. p. 290. ISBN 978-0-582-49380-3. ↑ Schechtman, Joseph B. (2007). "Jewish Legion". Encyclopaedia Judaica. 11. Detroit: Macmillan Reference. p. 304. Retrieved 6 August 2014. ↑ "League of Nations: The Mandate for Palestine, July 24, 1922". Modern History Sourcebook. 24 July 1922. Retrieved 27 August 2007. ↑ Shaw, J.V.W. (1991) . "Chapter VI: Population". A Survey of Palestine. Volume I: Prepared in December 1945 and January 1946 for the information of the Anglo-American Committee of Inquiry (Reprint ed.). Washington, DC: Institute for Palestine Studies. p. 148. ISBN 978-0-88728-213-3. OCLC 22345421. Lay summary. ↑ "Report to the League of Nations on Palestine and Transjordan, 1937". British Government. 1937. Archived from the original on 23 September 2013. Retrieved 14 July 2013. ↑ Walter Laqueur (2009). A History of Zionism: From the French Revolution to the Establishment of the State of Israel. Knopf Doubleday Publishing Group. ISBN 978-0-307-53085-1. Retrieved 15 October 2015. ↑ Motti Golani (2013). Palestine Between Politics and Terror, 1945–1947. UPNE. p. 130. ISBN 978-1-61168-388-2. ↑ Cohen, Michael J (2014). Britain's Moment in Palestine:Retrospect and Perspectives, 1917–1948 (First ed.). Abingdon and New York: Routledge. p. 474. ISBN 978-0-415-72985-7. 1 2 Bethell, Nicholas (1979). The Palestine Triangle. Andre Deutsch. ↑ "A/RES/106 (S-1)". General Assembly resolution. United Nations. 15 May 1947. Archived from the original on 6 August 2012. Retrieved 12 August 2012. ↑ "A/364". Special Committee on Palestine. United Nations. 3 September 1947. Archived from the original on 10 June 2012. Retrieved 12 August 2012. ↑ "Background Paper No. 47 (ST/DPI/SER.A/47)". United Nations. 20 April 1949. Archived from the original on 3 January 2011. Retrieved 31 July 2007. ↑ Morris 2008, p. 77–78. ↑ Morris 2008, p. 205.